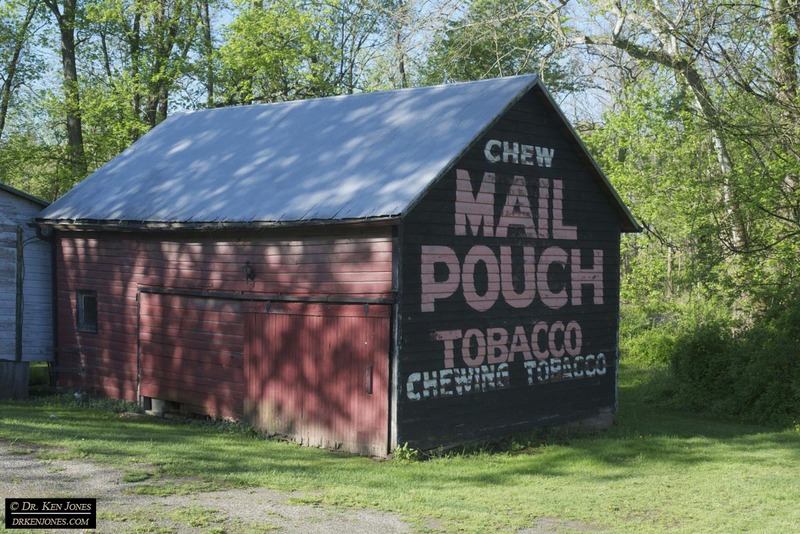 This very nice Mail Pouch Tobacco barn is just south of Halifax, PA, and was unknown to me before I spotted it. 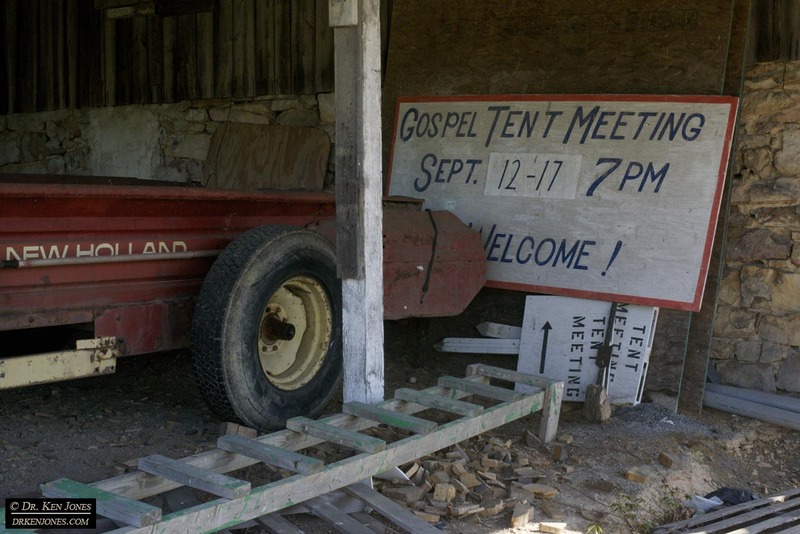 I went into the barnyard, through and open gate, and photographed the entire sign in lots of detail. The letters always look like they are melting. The farmer’ cows had a great deal to say – very moosical. 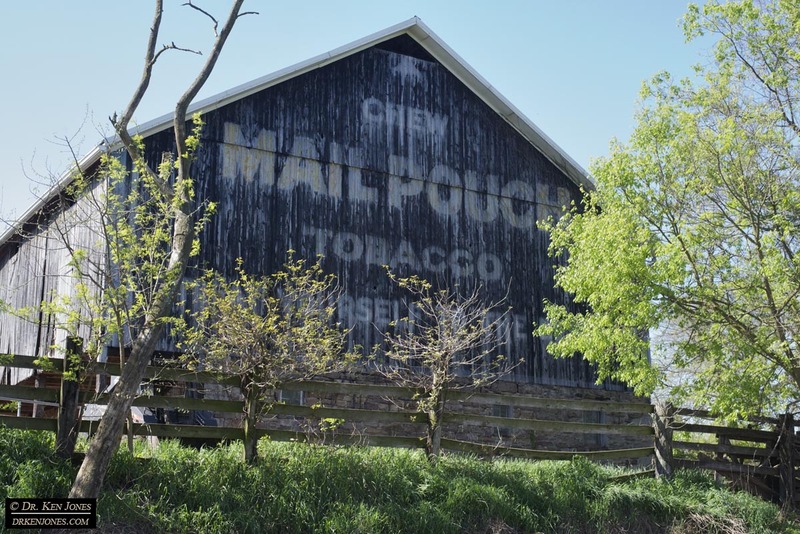 A very faded Mail Pouch barn, but I photographed it straight on as well and it can be enhanced. 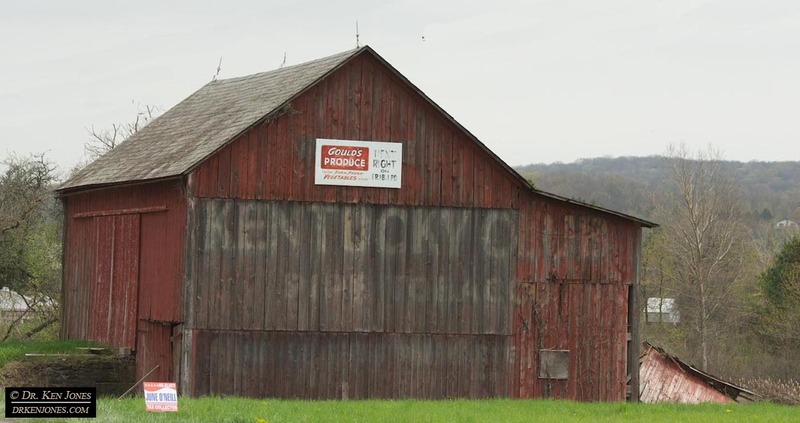 I’m not sure this barn was ever originally painted as a Mail Pouch ad. I think it was just done for fun. 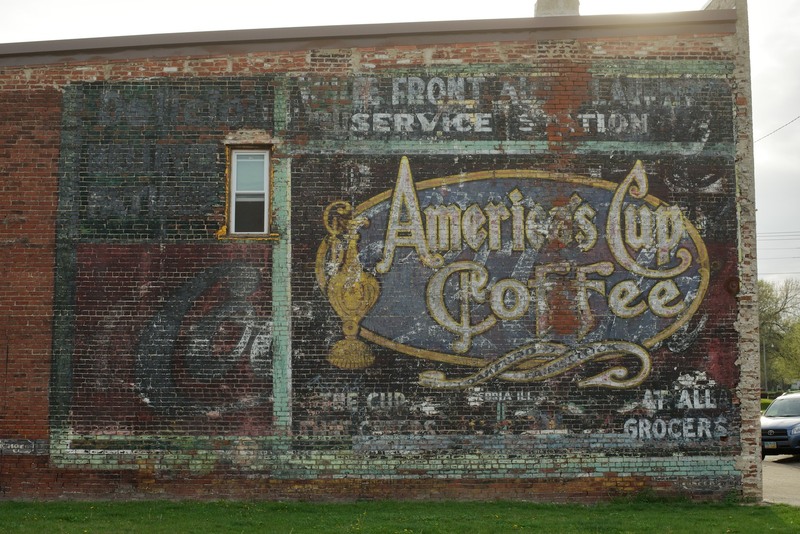 I found this sign in Alverda, PA, posted online and went to photograph it. Signs about now gone Flour brands are very popular. 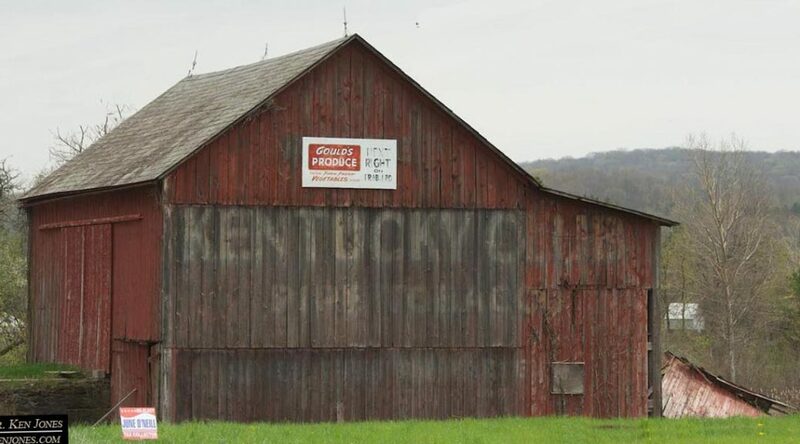 A different kind of barn. 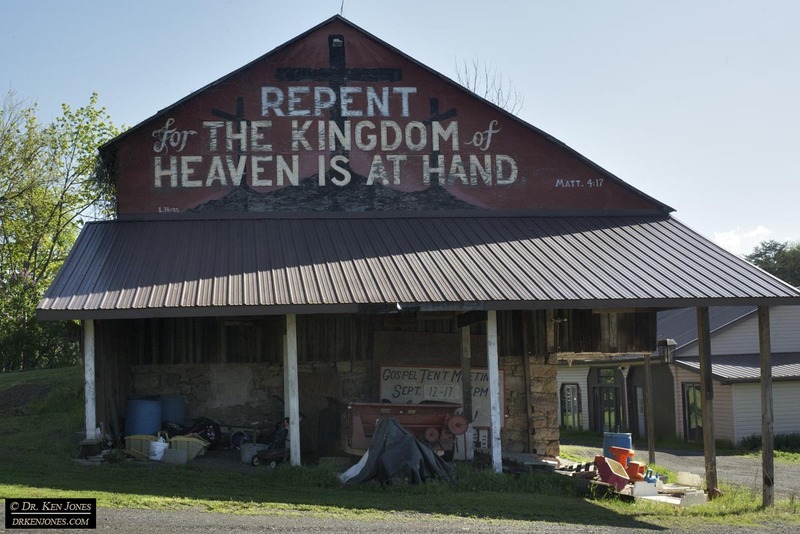 I asked permission of a very nice couple who let me go up their driveway to photograph the barn. It belongs to their sister. Thanks to all. 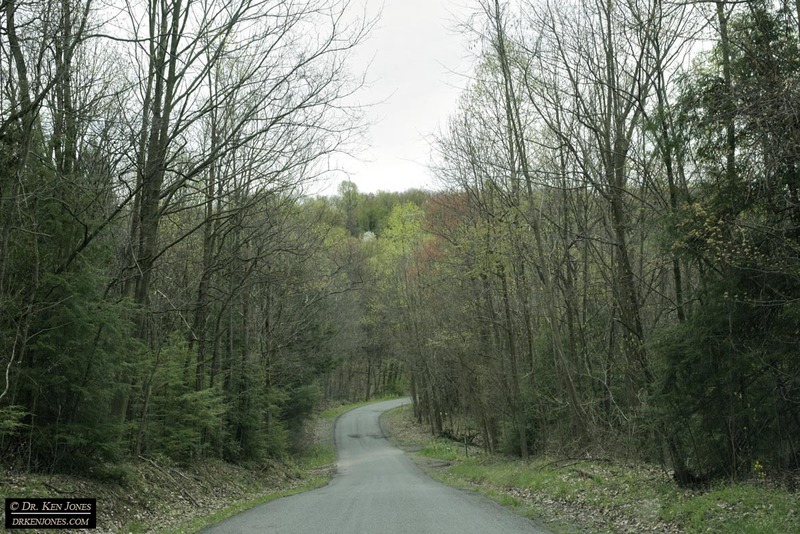 The GPS took me on this small back road to Johnstown, PA. 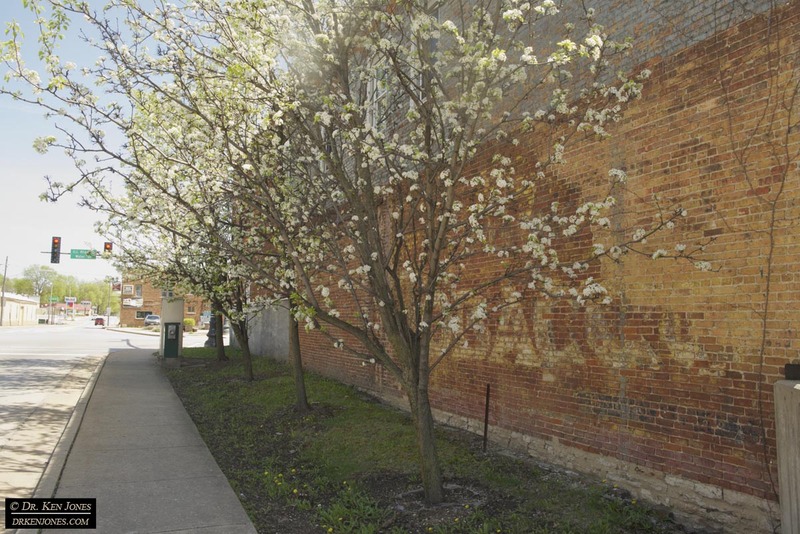 It was twisty, bumpy, potholey – in summary, wonderful. 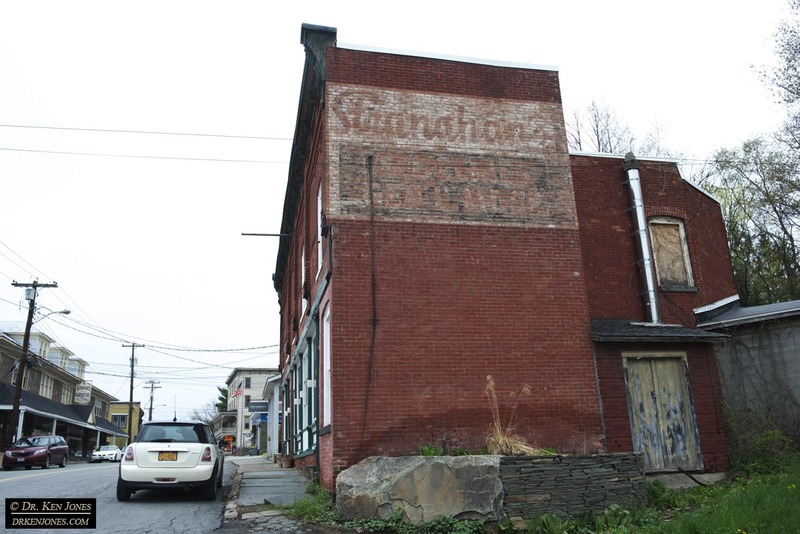 I had been to Johnstown before, but this sign was exposed in the last two years. 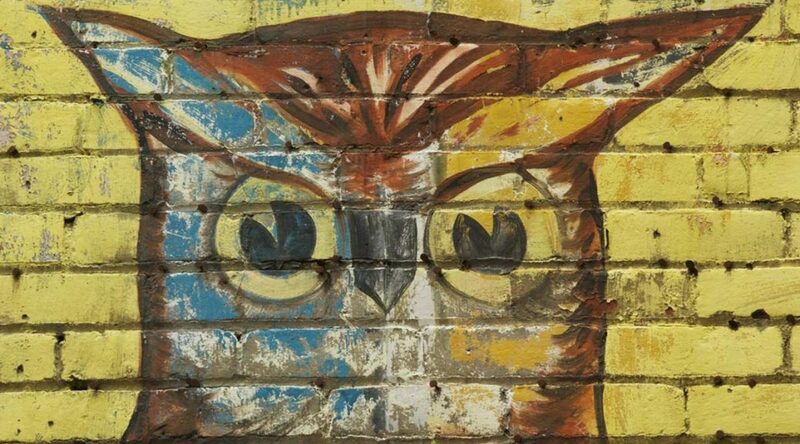 It may be the best Owl Logo I have seen. No tuckpointing or cleaning. 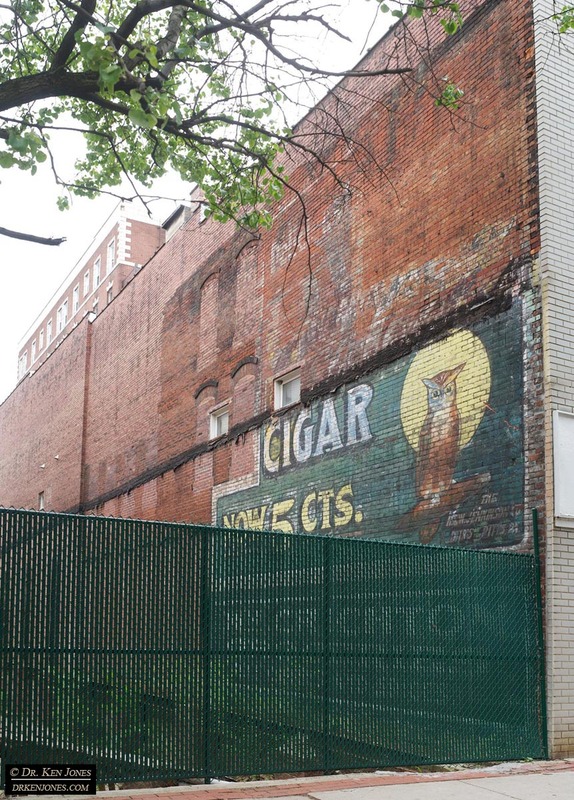 It may have been painted by the same sign painter who did the Owl Cigar signs in New Kensington that were revealed a few years ago. When I arrived, it was sunny which produced bad tree shadows across the graphics. I waited about an hour for a storm front to arrive with a nice overcast sky. 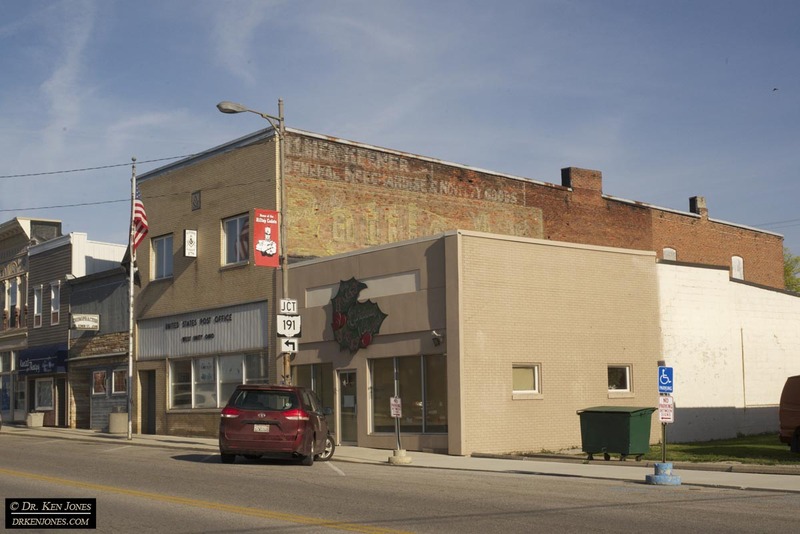 I spoke to a couple about living in Johnstown. They were around my age. They had grown up here, moved to the DC area, and then returned for family reasons. What struck them on returning is that everything is expensive in Johnstown. Utilities are triple in the DC area. I found that gas is the same as Los Angeles. 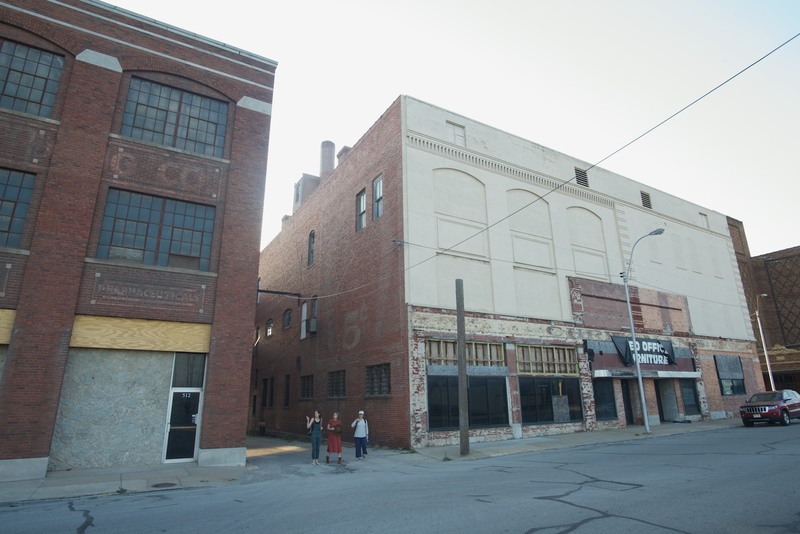 The city is slowly dying because it is not connected to the world by any major highway. The young people are leaving because there are no jobs. 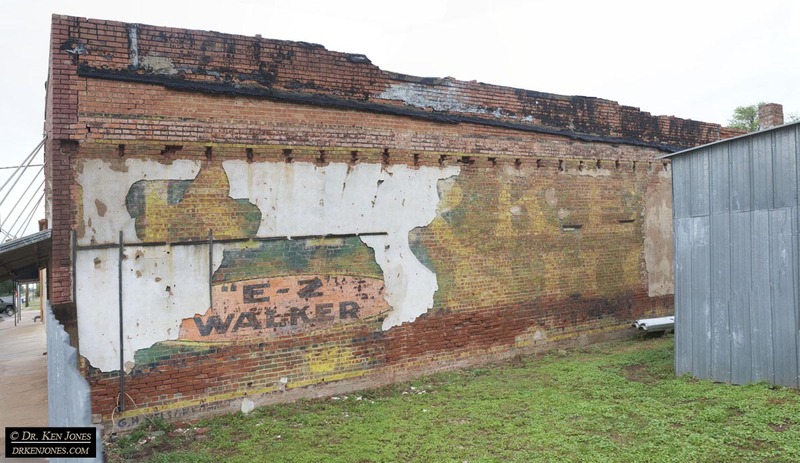 Its past industries were Bethlehem Steel and coal. Needless to say, I saw many Trump posters. 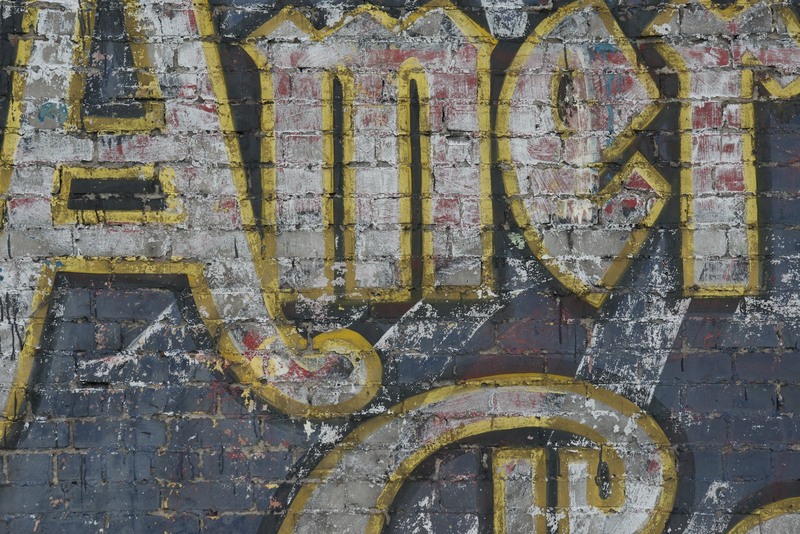 Once it became overcast, i used my pole rig to photograph the entire sign over the fence. Here’s lookin’ at you, kid. I’m looking forward to stitching all of the photos together when I get home. 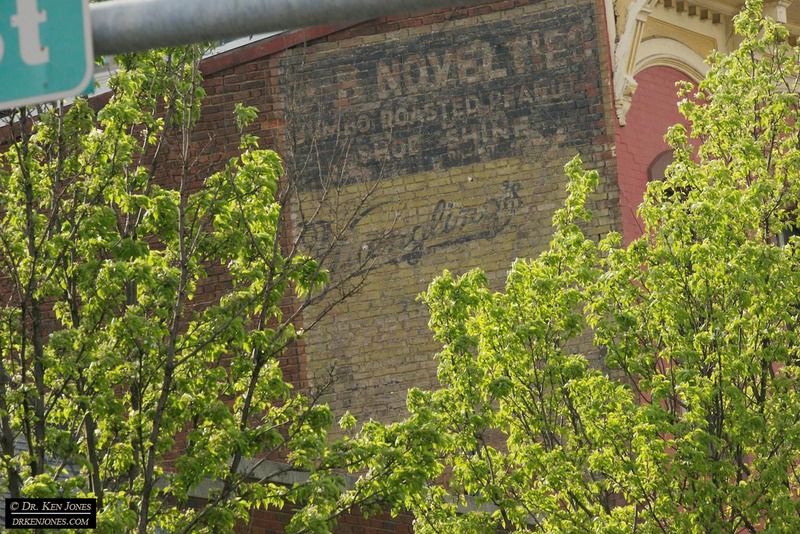 I’m filling in gaps in my ghost sign collection – which means that I am visiting the places that were too out of the way for previous trips. 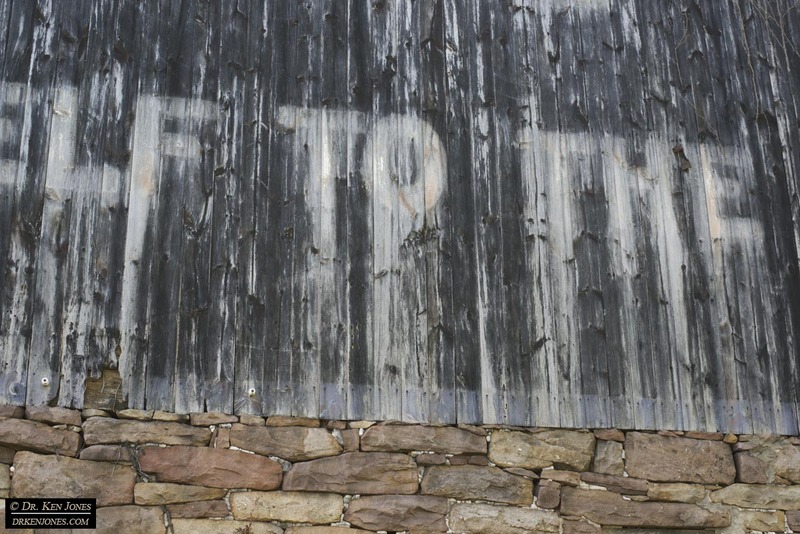 I photographed a couple of signs in Narrowsburg, NY. 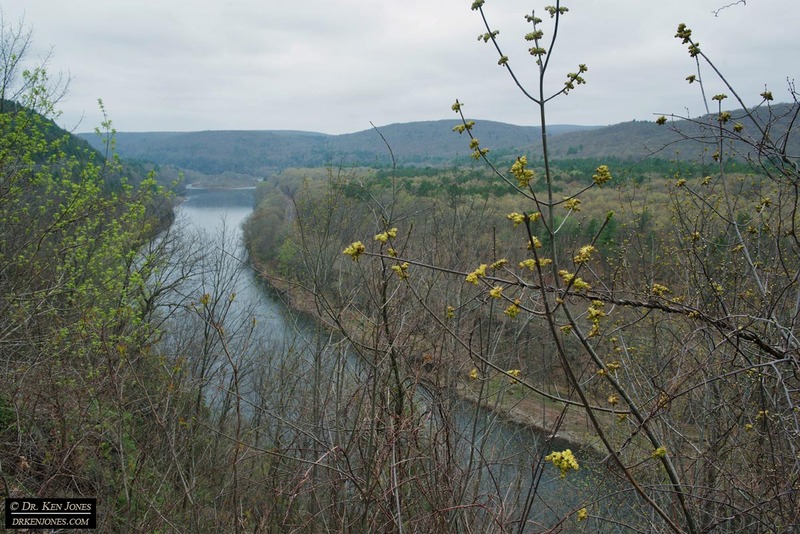 The town is located on the upper parts of the Delaware River. 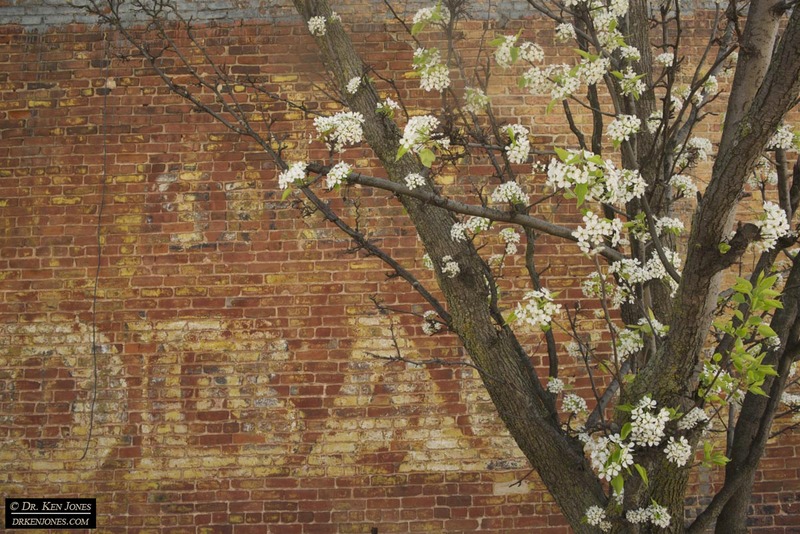 The leaves on the trees are very late this year – just a few buds and flowers. 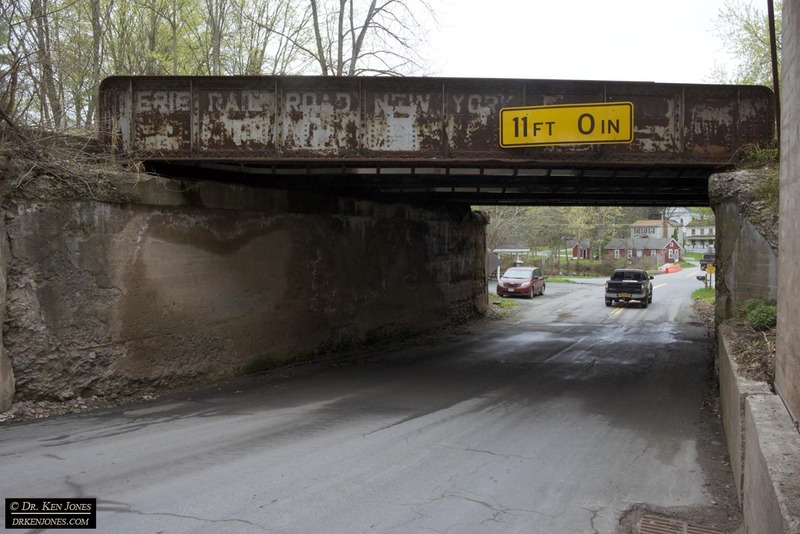 RR bridge in Narrowsburg for the Erie RR. 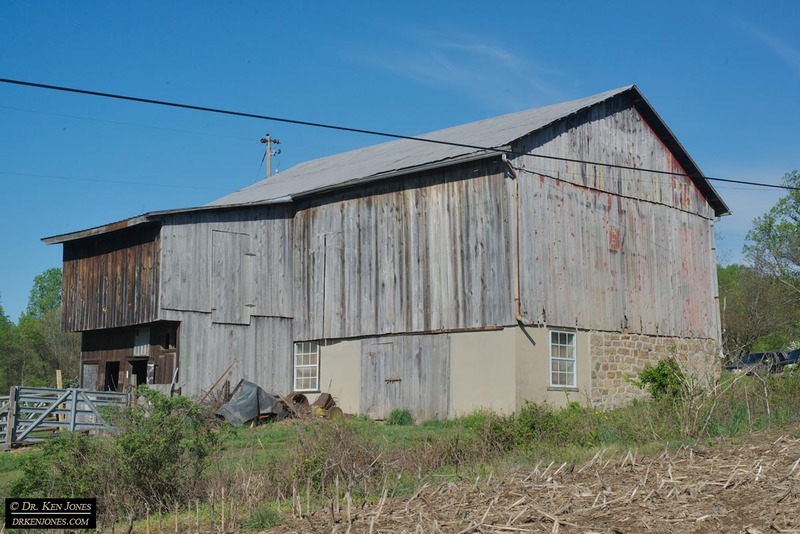 I photographed this nice un-repainted barn for Kentucky Club Pipe Tobacco in Brodheadsville, PA. Another barn, for Mail Pouch Tobacco, near New Tripoli, PA, has apparently been demolished (or sold to Barn Wood Builders?). 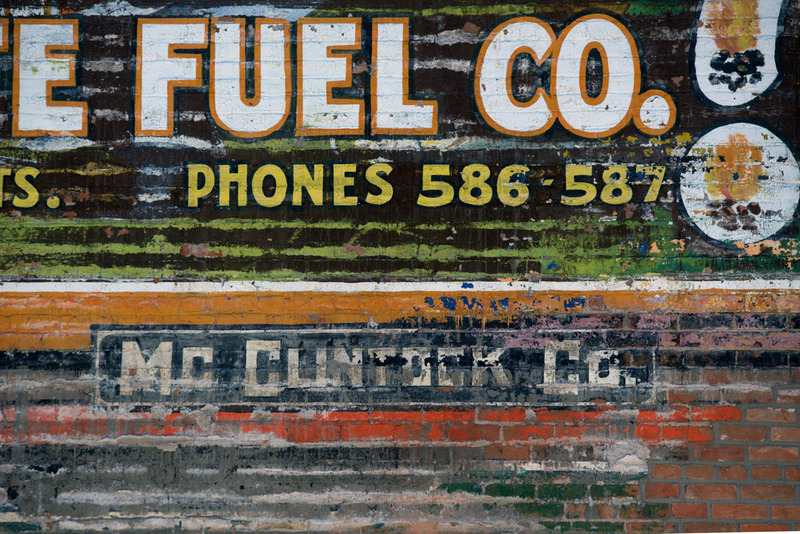 I had visited Pottsville, PA, before and photographed this great revealed sign for Mail Pouch Tobacco. It is still there as of yesterday. 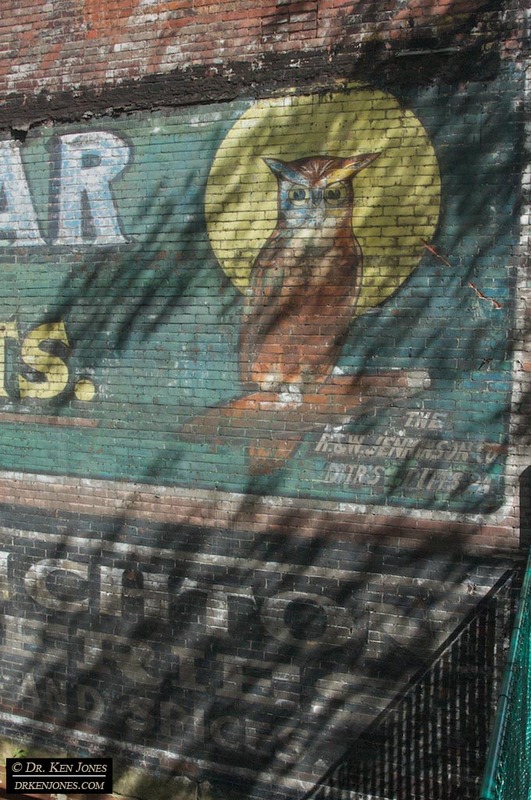 However, as usual, there were more signs, a couple of which I “discovered” while photographing signs I knew about. 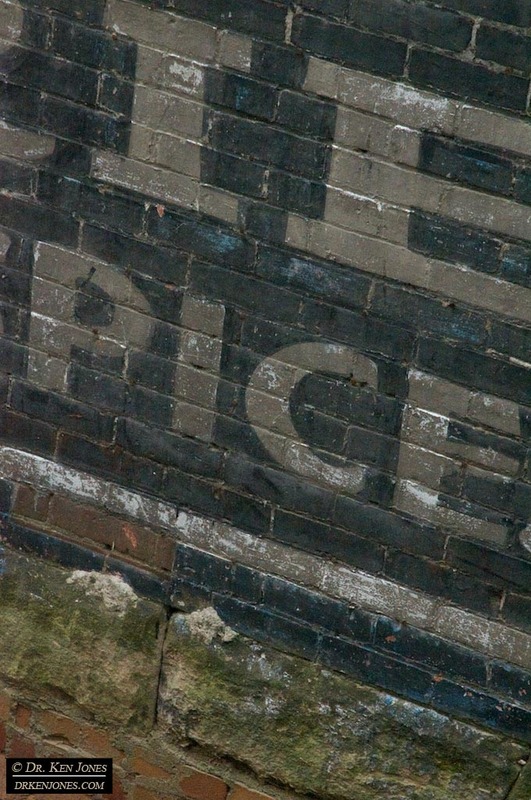 This mystery sign will require some work to reveal its contents. 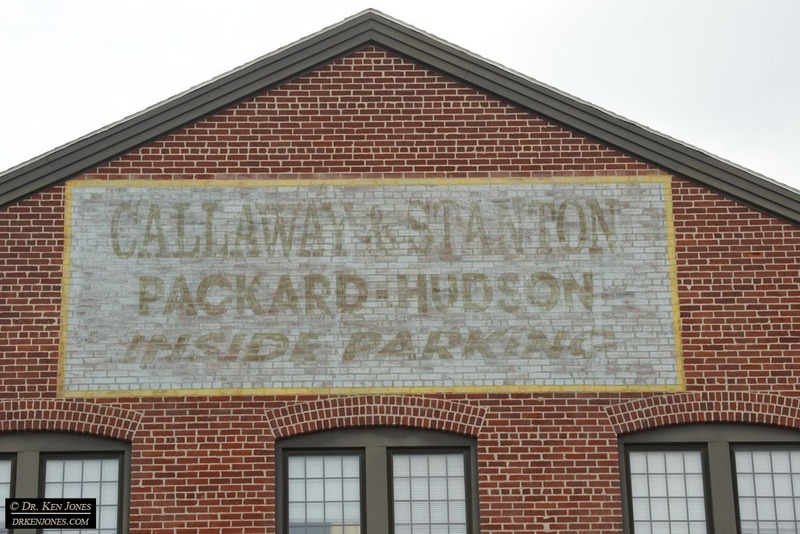 Another sign is for the Packard-Hudson dealer. 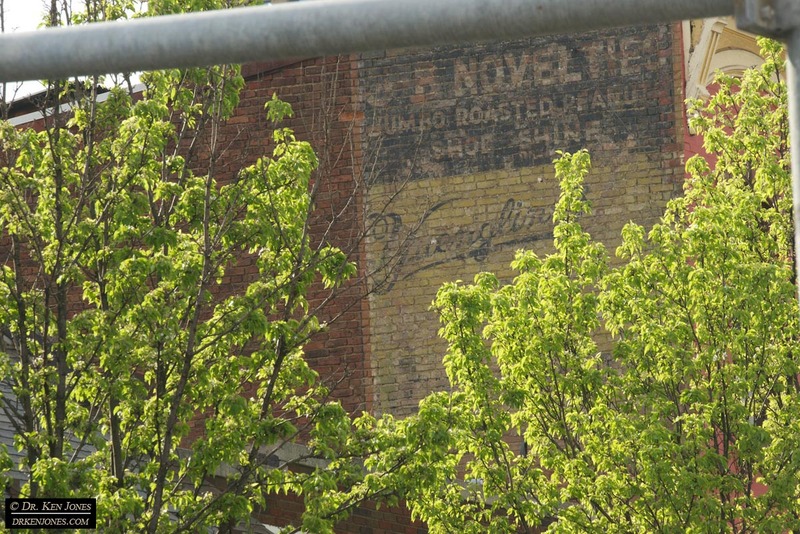 Also., this great sign for Yuengling Beer was coverted by trees. I had to shoot from all sorts of angles to try to get complete coverage. I’ll post the results later. 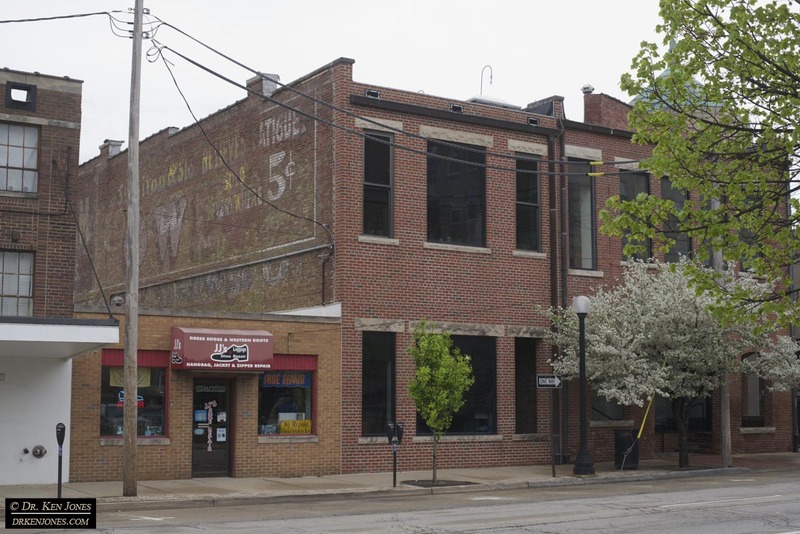 Although Yuengling sounds like some sort of Asian imported beer, it is actually the oldest brewery in the United States, family owned, and started in 1829. 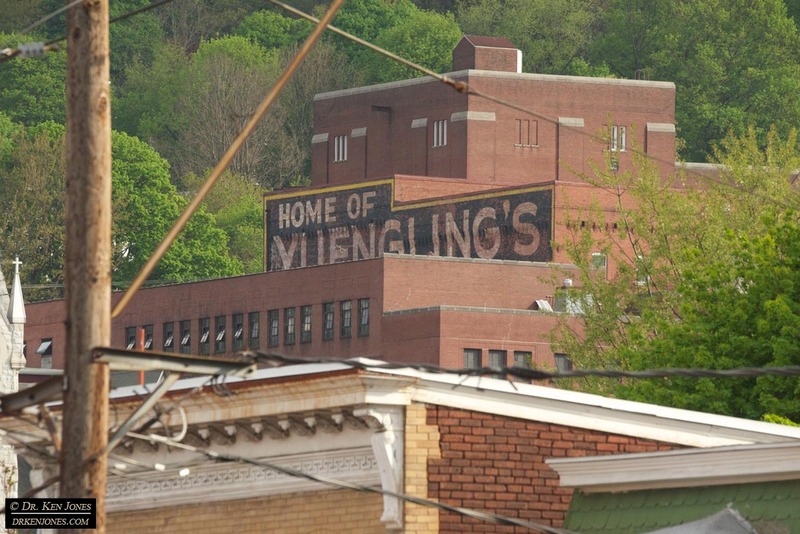 Pottsville is the home of Yuengling’s. They have factory tours. 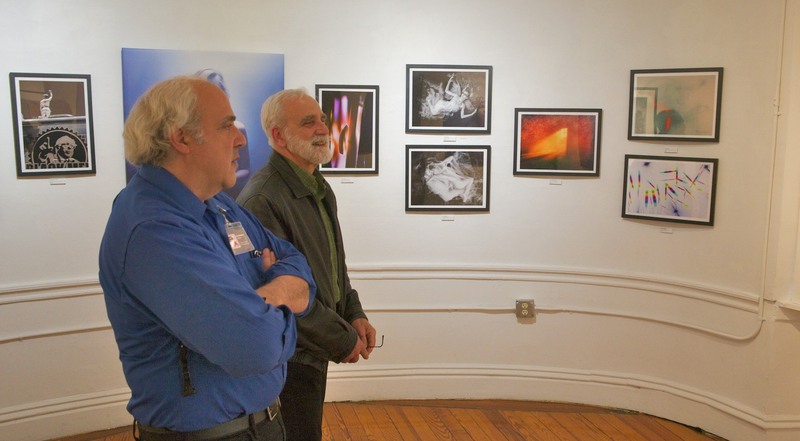 Thursday night I went to the opening of the show “Unseen, Photography Beyond the Visible” at the Providence Center for Photographic Arts. One of my photos was accepted and on display. 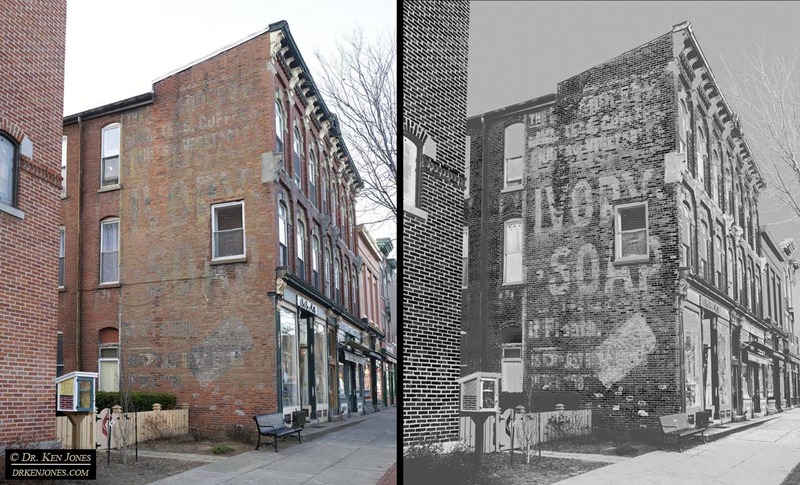 It shows a ghost sign in Baltimore with an unprocessed image side-by-side with the result of my enhancement process. I received an Honorable Mention which pleases me since my photo isn’t really “artistic” in the sense of interesting angles or lighting. It is documentary. 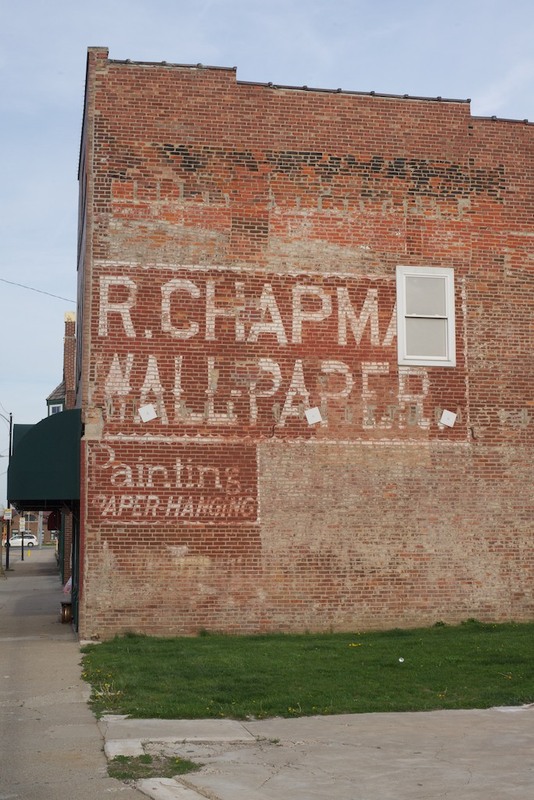 Nevertheless, I had lots of interest and met with many visitors discussing my methods for stitching and enhancing ghost signs. They liked the photo and the entire American Ghosts project. 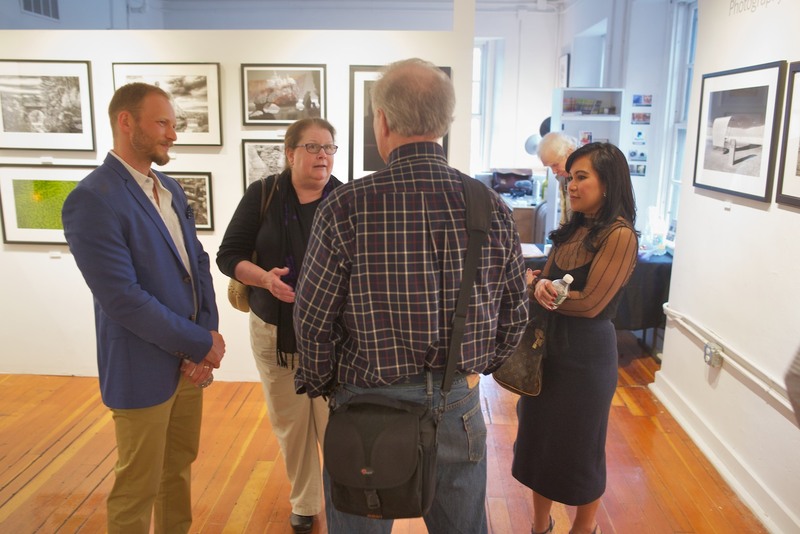 There were around eighty photos on display. I met many super interesting people since this show incorporates very specialized photo methods. 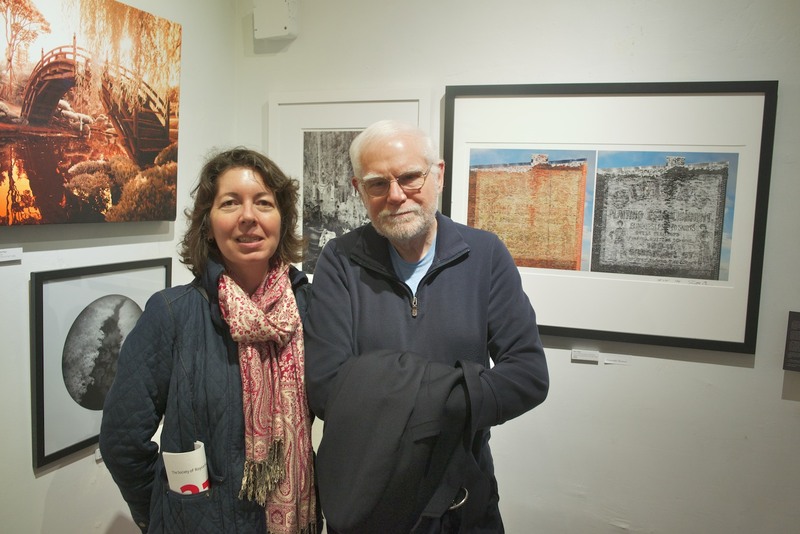 One couple who came is an old friend Jim Head from Brown University. He heads up the Planetary Sciences Group where I went to graduate school. 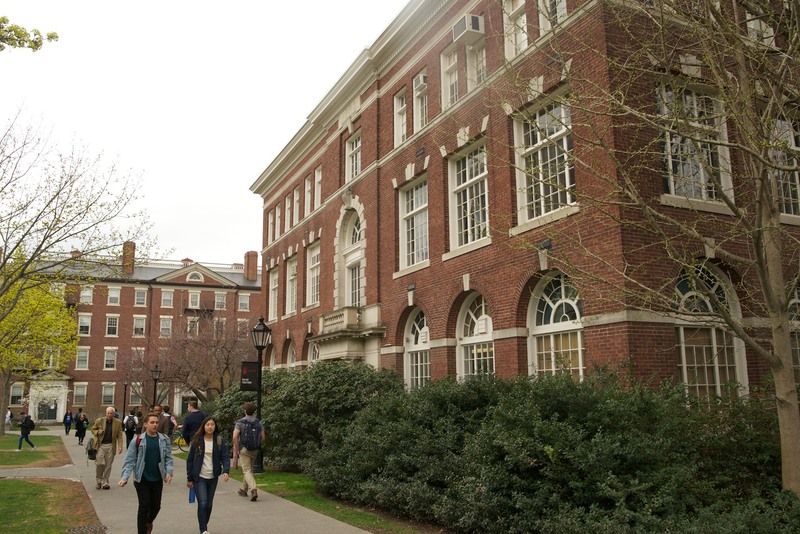 I dropped by Brown University and visited the Planetary Sciences building. 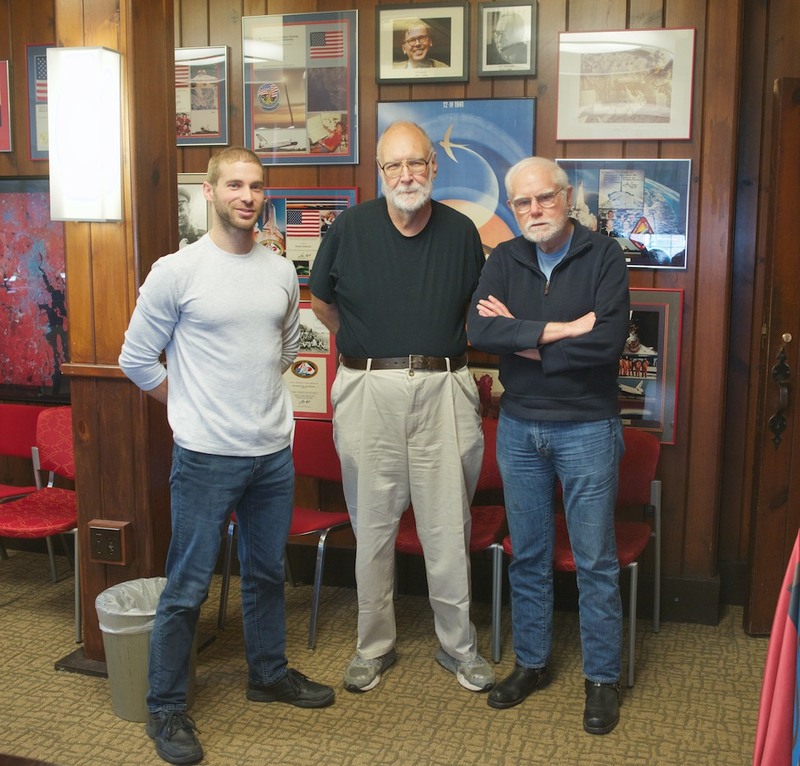 David Weiss, myself, and Jim Head. I was invited to David’s thesis defense the next day. Now he is Dr. Weiss. It turned out that his thesis drew partly on work I had done on my thesis back in 1974 on Mars Crater distributions. It was pure chance that I happened to be there that day. My work was done using Mariner 9 imagery data, acquired with 1960’s technology! I hadn’t been in touch with the Mars Community for a while, and was astounded, and pleased, to be told that my thesis and subsequent published paper are now considered seminal works on Martian geology. The conclusions have held up to the test of time. That is unusual in science that involves such rapidly changing technology. 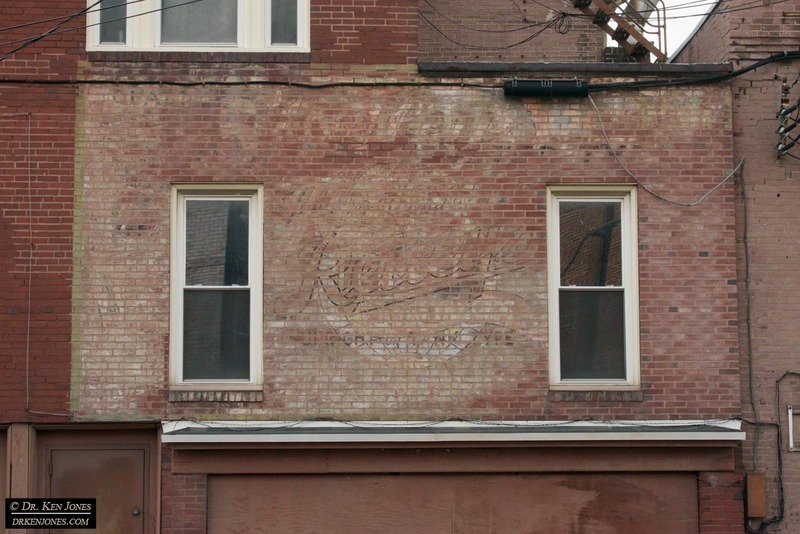 Hopefully, my ghost sign photography will be received the same way. I’m so busy driving, photographing, and downloading photos that I don’t have much time to devote to posting. Here are several from Oklahoma, Missouri, and Illinois. 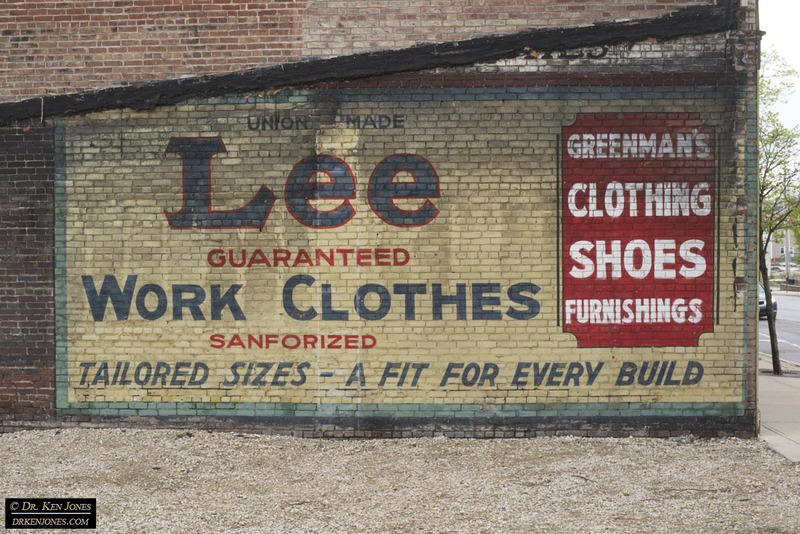 I had been to Muskogee OK before, but, as usual, there were plenty of more signs to photograph. 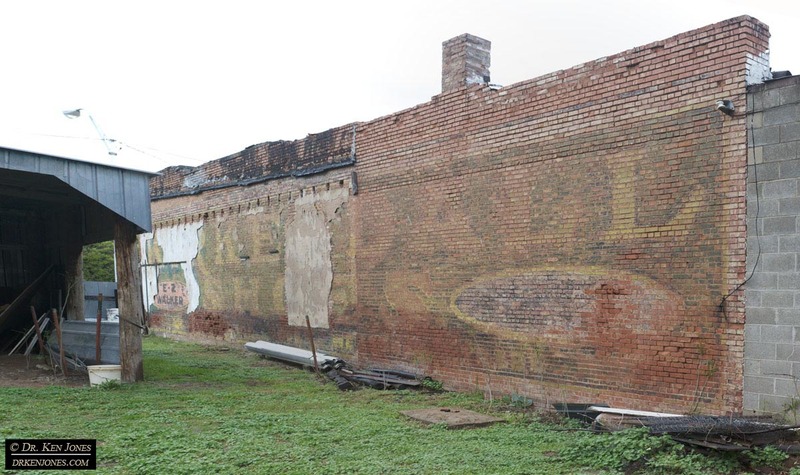 There is a very nice sign on the wall, I think for tobacco, in this alley in Joplin, MO. I had photographed it last October, but there were bad shadows. I was hoping for overcast, but it cleared up before i got there. 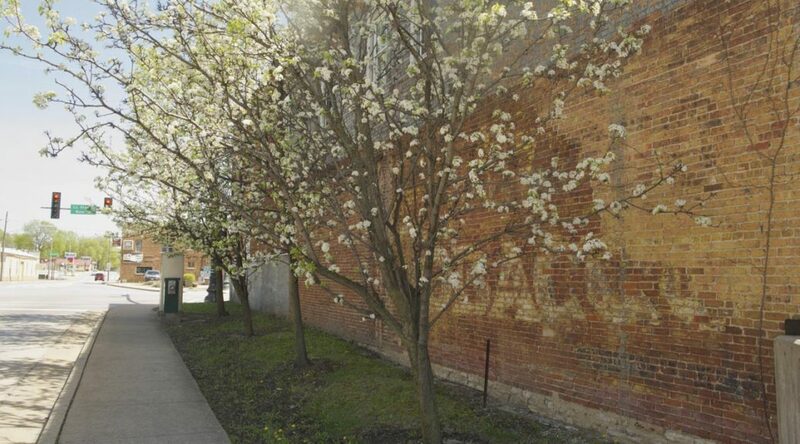 Since this is a south facing wall, and since it is past spring equinox, by waiting for the sun to “move” slightly north of the E-W orientation of the wall, I was able to photograph it in complete shade. I wasn’t the only photographer out there. 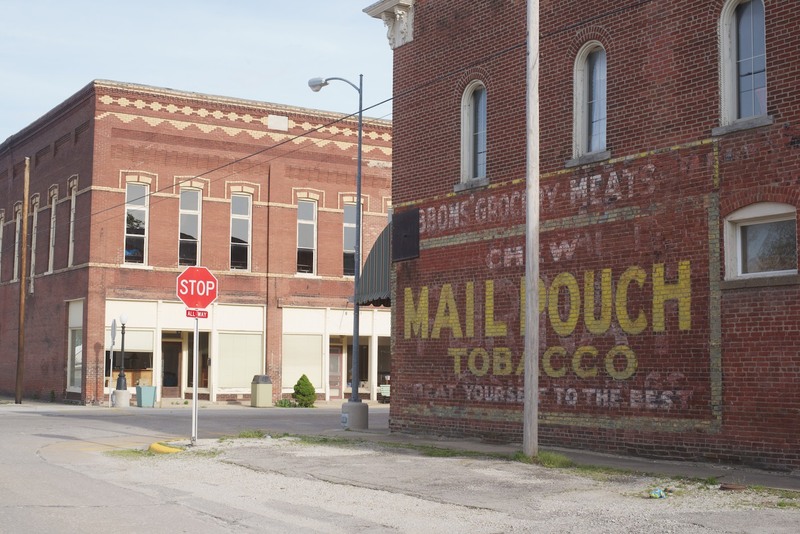 There is a sign for Mail Pouch Tobacco in St. Elmo, Illinois, that appears to have been partially repainted. 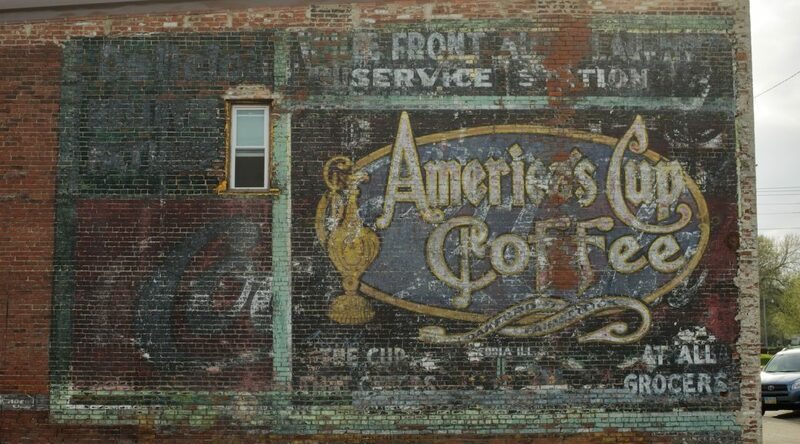 One of the main ghost signs I wanted to photograph on this trip is this recently exposed sign for America’s Cup Coffee in Mattoon, IL. 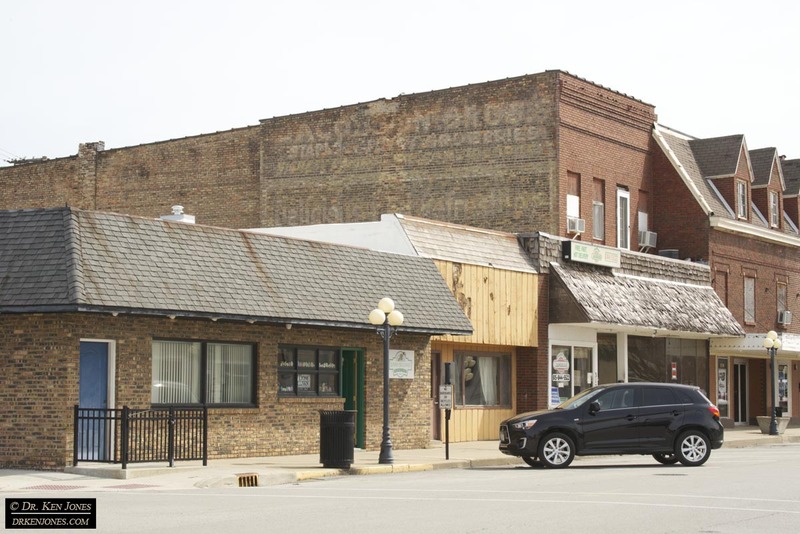 I had been to Mattoon before, but it was still covered. 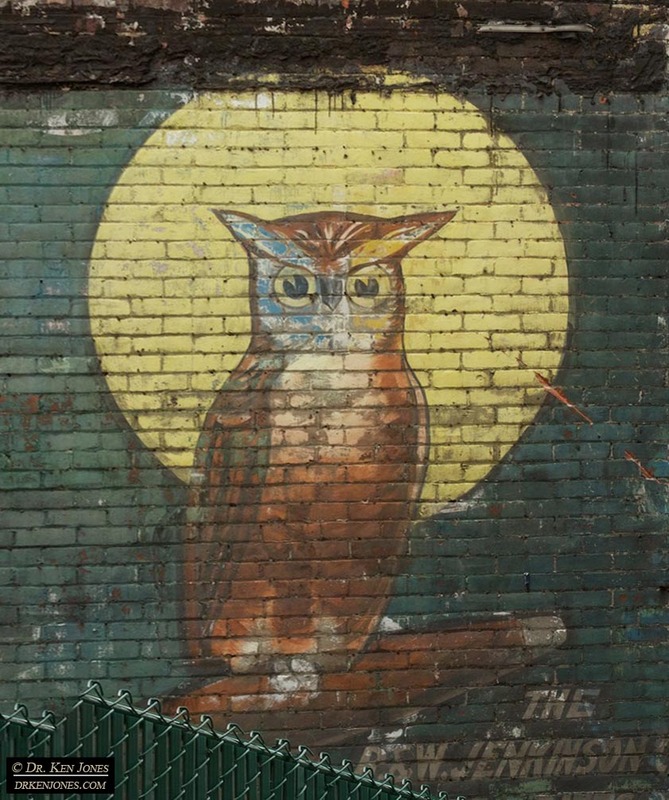 I found it on Google Street View. 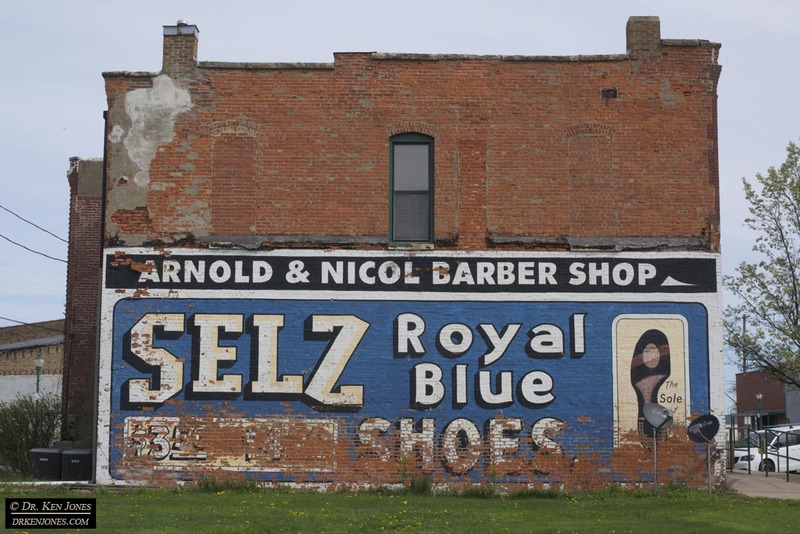 I had photographed this other sign in Mattoon on a previous visit, but the lighting was better on this visit. 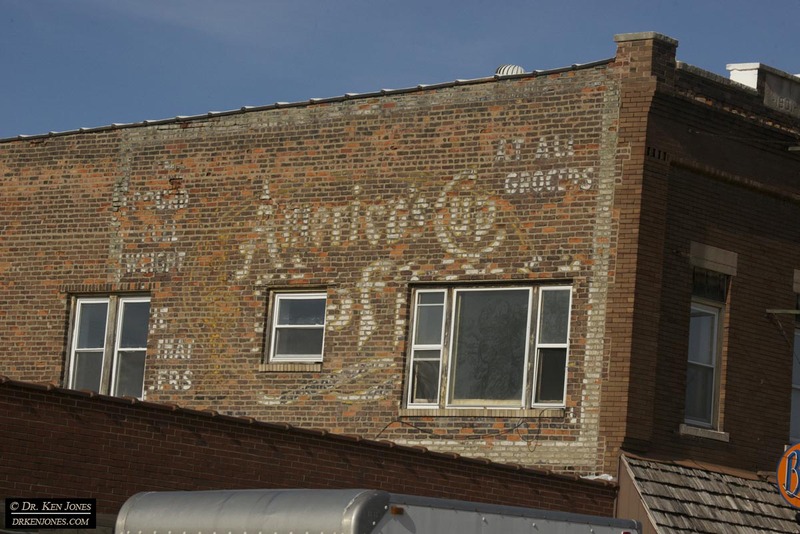 I’m picking up some ghost signs that I had missed before, and doing a couple of reshoots. 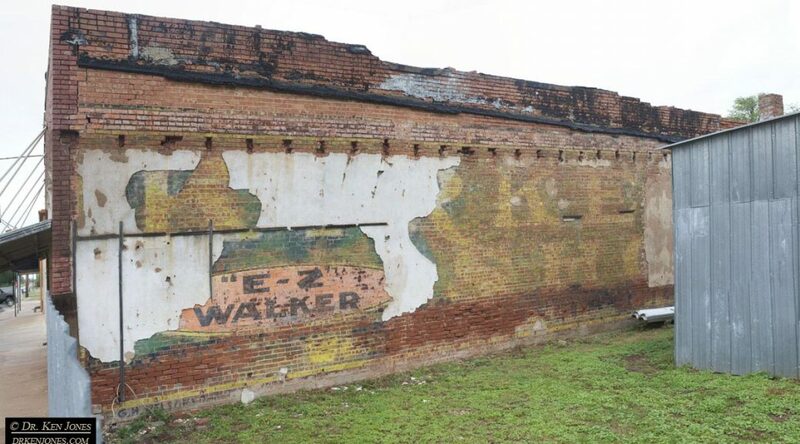 Here is a beautiful ghost sign, in Nash, OK, for Kirkendall Shoes, including E-Z Walker brand. 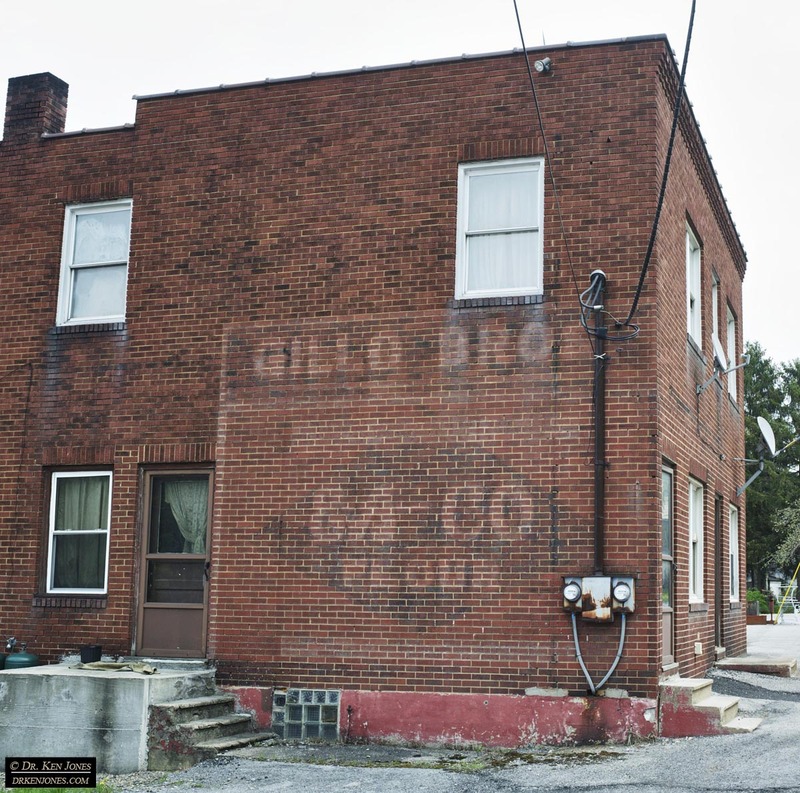 I originally found it using Google Street View. I had photographed this sign last October, but I needed to reshoot it with a nice overcast sky, so yesterday I got just that. 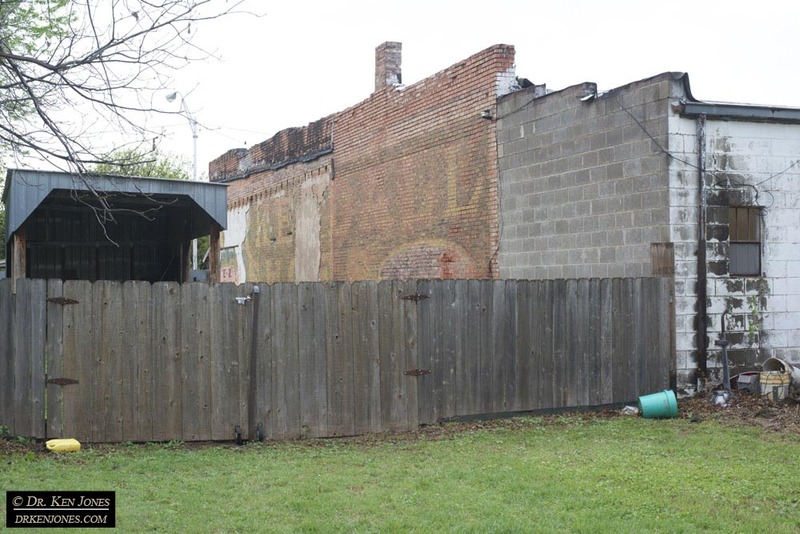 It required photographing it over a fence from both sides. I really like the colors on this sign. I also had to shoot around the metal shed. I’ll assemble all of the images when I get home and make a single straight-on version. 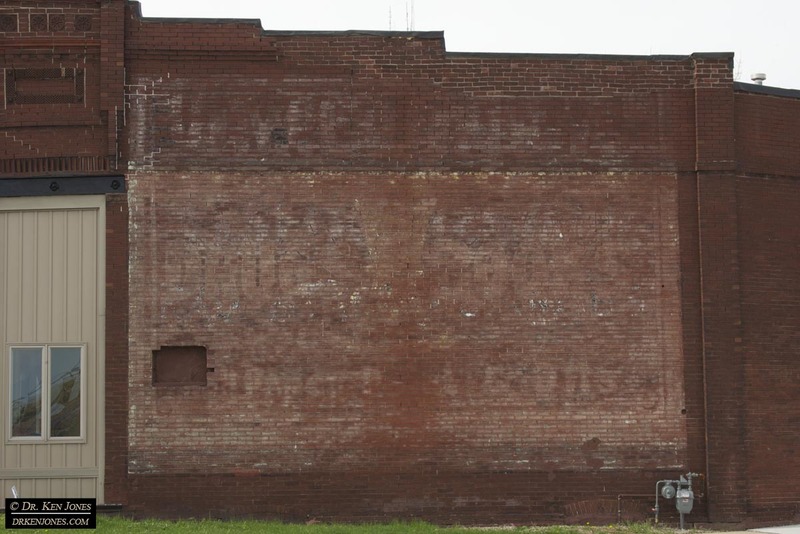 There are plenty of other less attractive but still interesting signs, like this one for Chrysler-De Soto. One of the main crops in the Texas Panhandle is cotton. 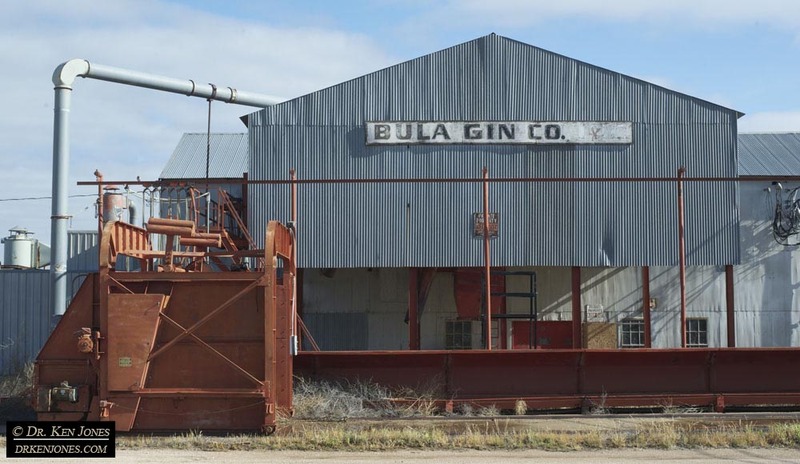 Here is an active Cotton Gin mill in Bula, TX. 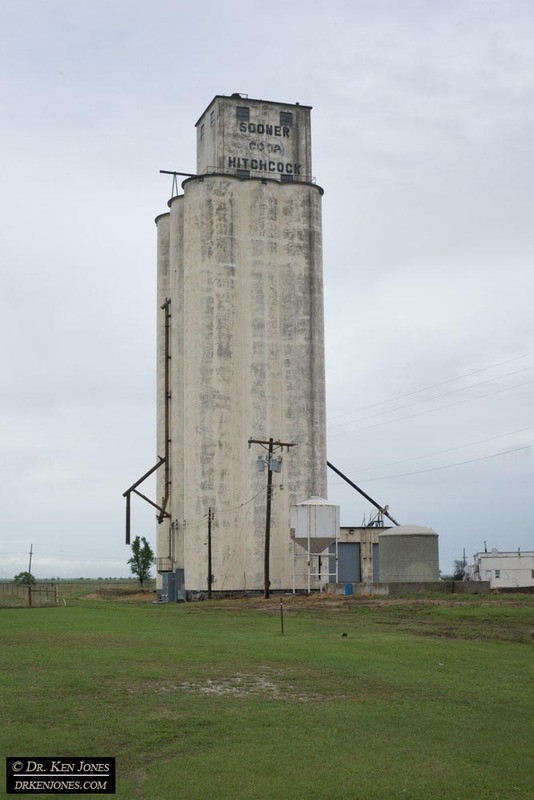 And, of course, every town has its own Grain Elevator, like this one in Hitchcock, TX. I drove over a rise at 75mph (the speed limit!) and almost had pork cutlets for dinner. 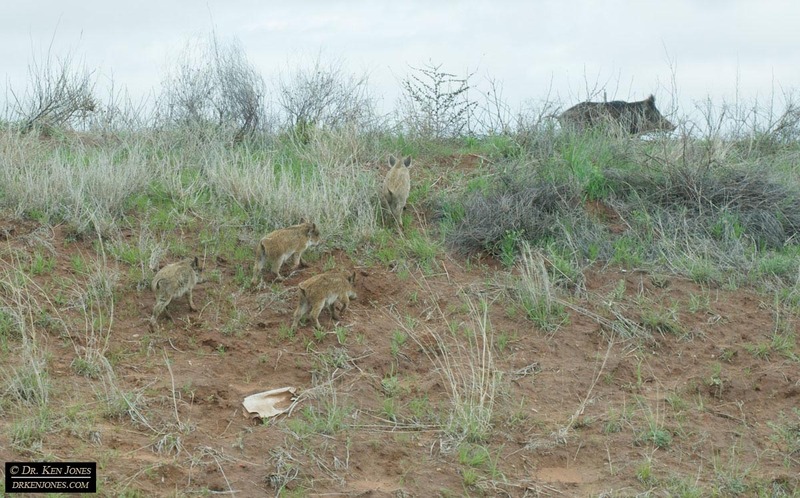 A mom Peccary with four piglets were right in the middle of the highway. Fortunately, I was able to stop, and knew that there was no one behind me for miles. Mom finally got them to scramble off the road, so all ended well. Another day of dark skies and severe storms illustrated by this aviation Vortac against the farmlands in the Panhandle. 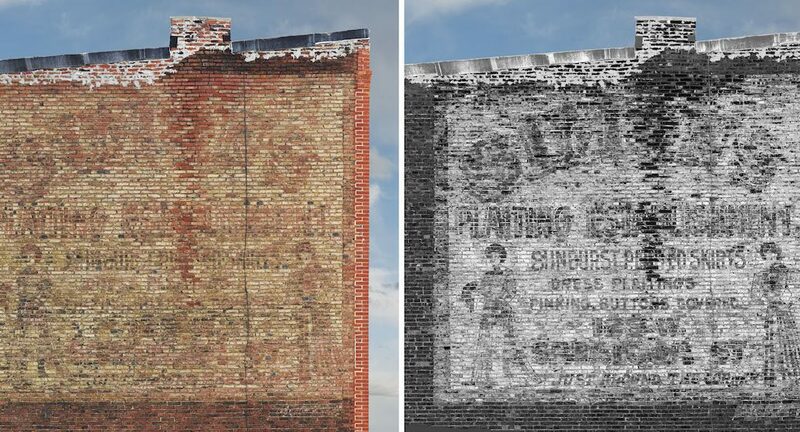 Now that the Spring Equinox has past and the days are getting longer, I have begun a Ghost Sign Harvesting trip across the US. 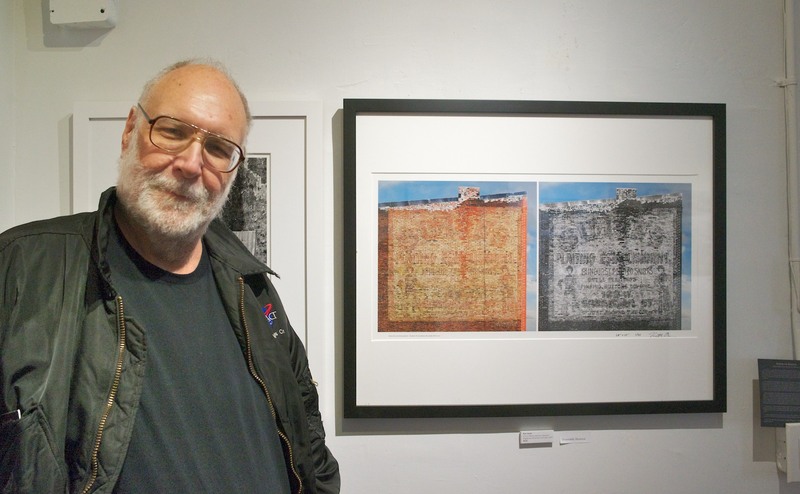 I am planning to arrive in Providence RI in time for the April 20th show opening that includes one of my photos. I left my wife and her visiting cousins at home while I go on a mad dash across the country. 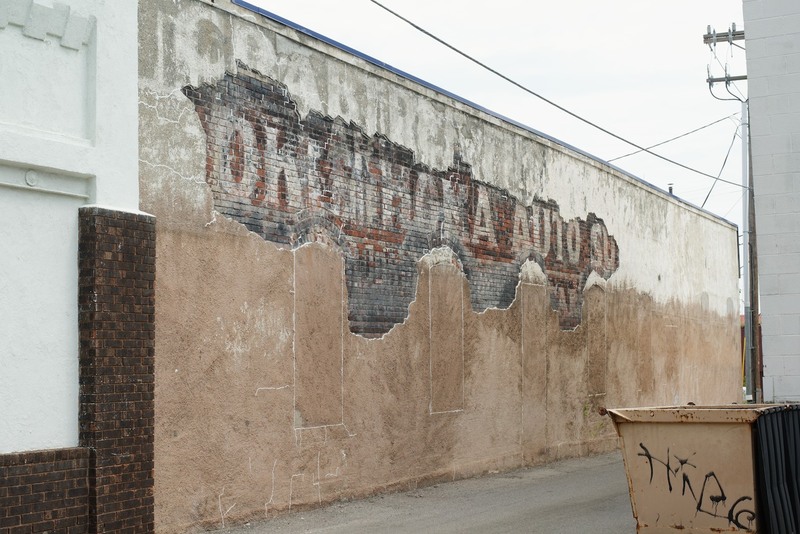 One of the primary ghost signs I was hoping to get, and photographed yesterday, is this one in El Paso, TX. It was exposed over a year ago. “Buy your Winter Coal Now – We answer your burning questions.” I was able to lift my camera over the protective fence and get the entire sign in very high resolution. 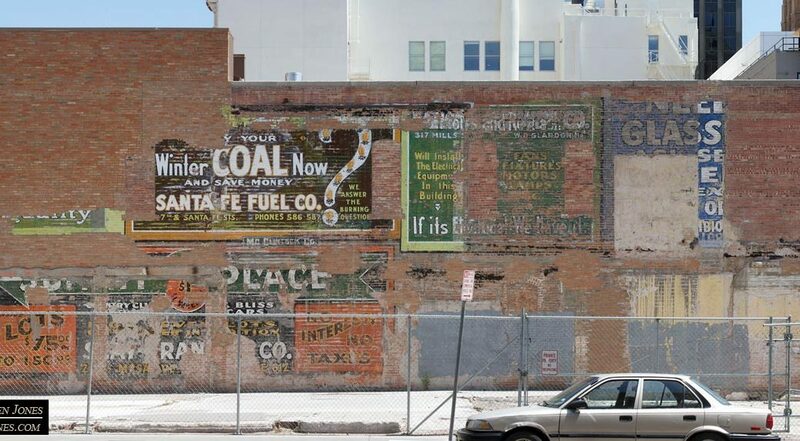 I had been to El Paso before, but as usual, I was able to find even more signs on this visit. One can estimate the age by the telephone numbers – 586 and 587. 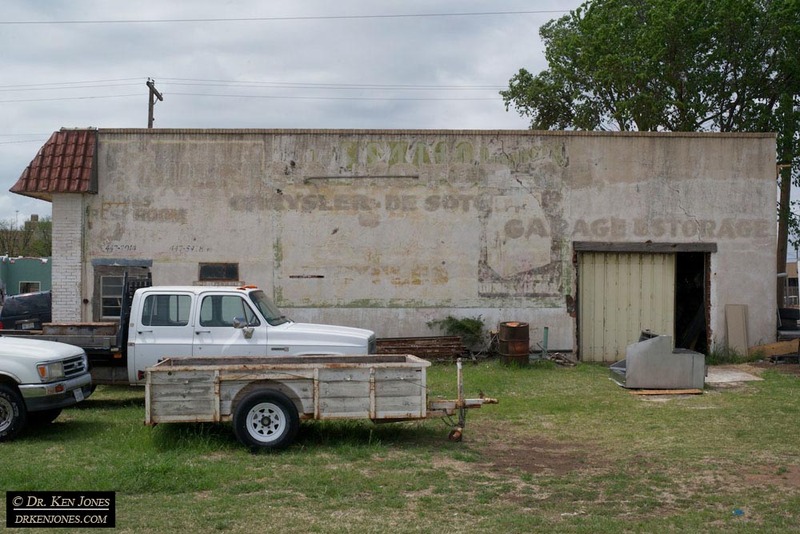 Most ghost signs are not quite as impressive, like this sign for Phillips 66 gas in Malaga NM. I ran into some impressive storms. I was going to get a sign in Artesia NM but there was a severe weather warning for extreme flooding, high winds, and expected severe hail damage for vehicles. I went a different route. The images on the news later showed cars in Artesia half deep in flood waters, and there were impressive smashed windshields. I chose wisely. I thought I would include some other photos from along the way. 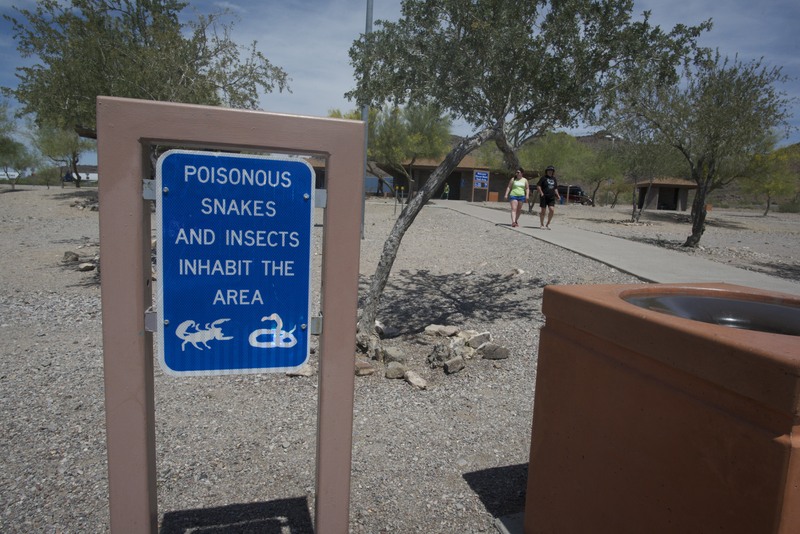 I don’t remember seeing warning signs for scorpions, like this sign in Arizona, for rest areas back East. The ones back east should have warnings for ticks. 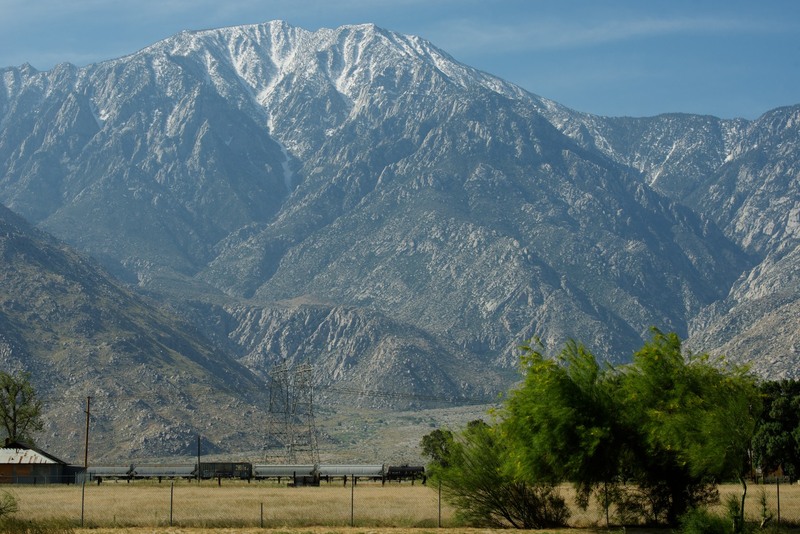 Leaving Los Angeles, there was some new snow up on Mt. San Jacinto from a storm we had a couple of days ago. The vertical rise from where I am to the top of the peak is over two miles. 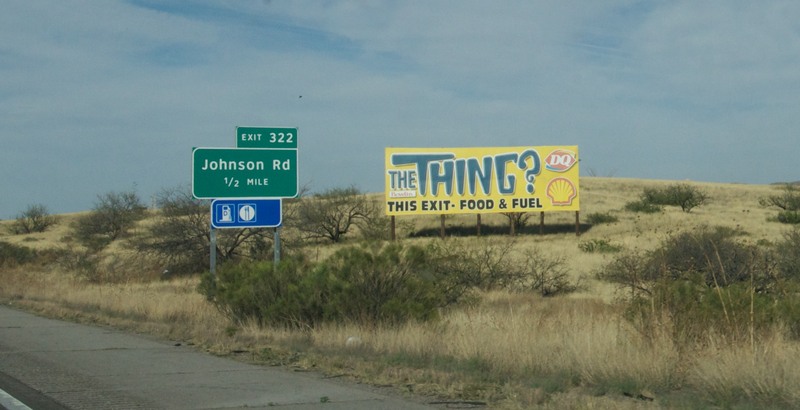 Ads for Roadside Attractions continue to exist in the best tradition of the good old days of road travel. 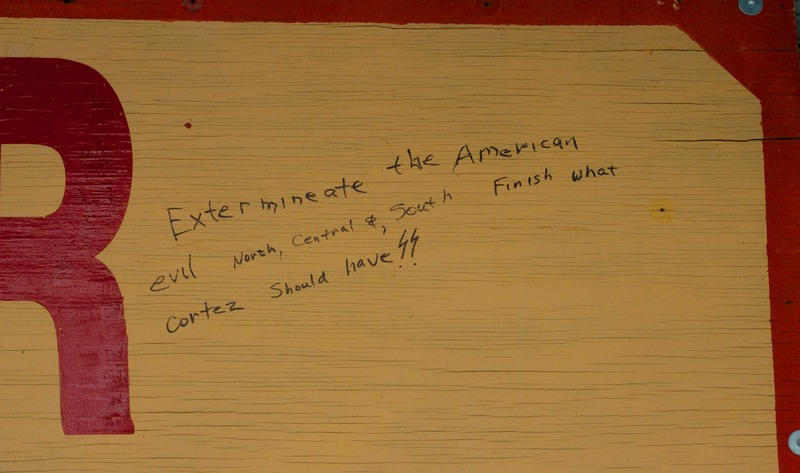 I found this misspelled bit of Nazi SS propaganda in El Paso. Interesting, the bridge crossing across the Rio Grande River to Ciudad Juárez was very busy in both directions. I almost got diverted by road construction into crossing the river. 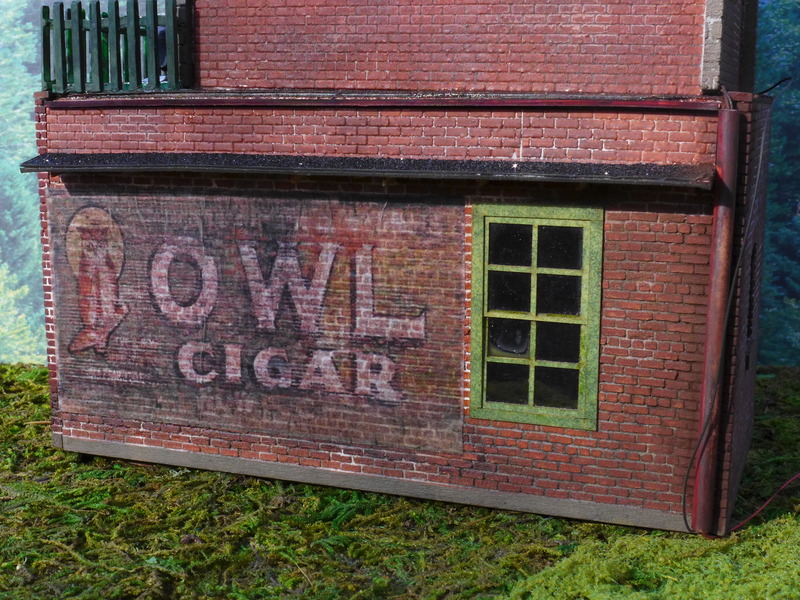 I was contacted by a member of a large group of model railroaders about using one of my photographs as a graphic to be added to a model railroad building. 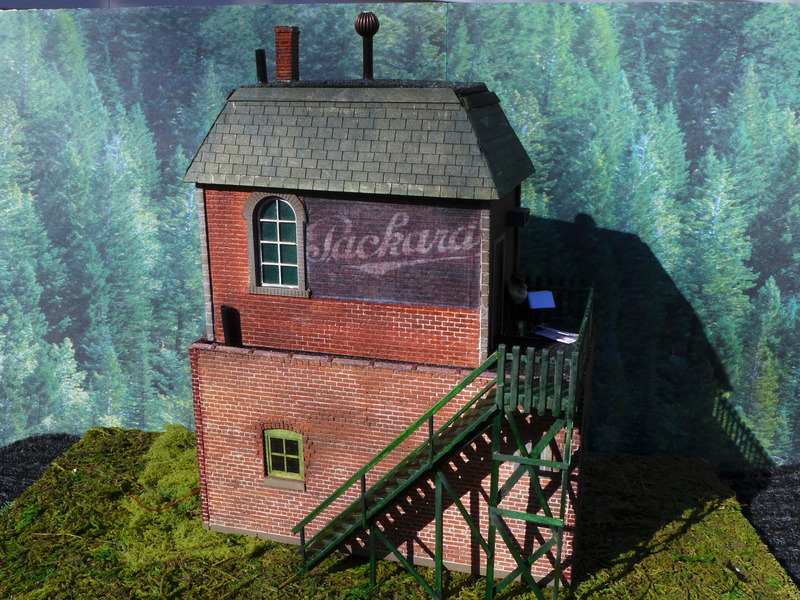 Although I have never built a train layout, I have enjoyed them since I was a kid, so of course I agreed. 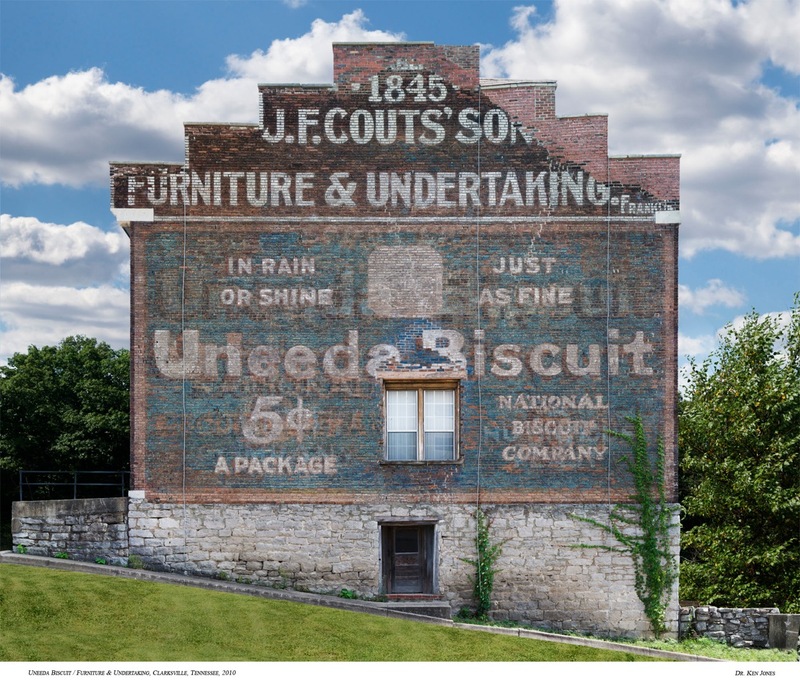 Here is my original photograph, from Clarksville, TN. 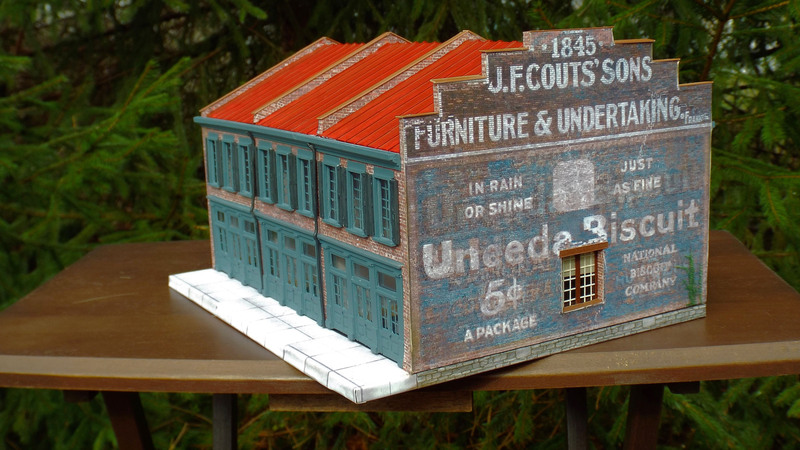 Here are a couple of other of my ghost signs incorporated into model buildings, models by Ted Dimone. 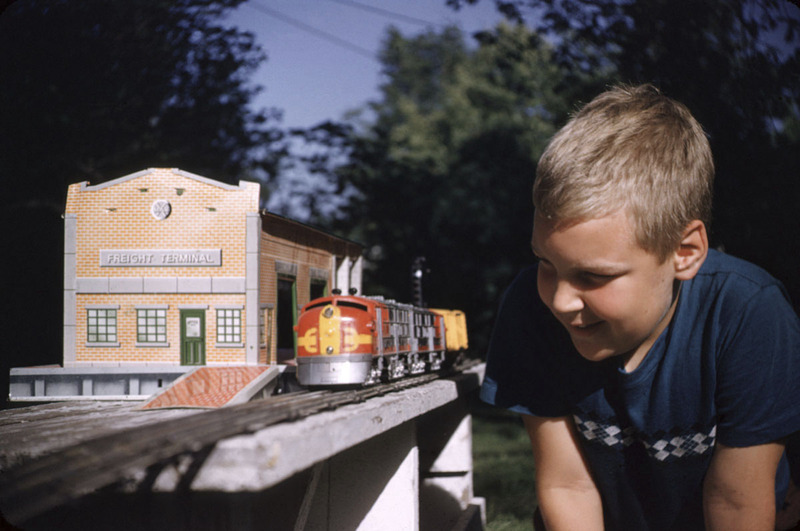 Just to illustrate my extensive personal model railroading background (not), here I am in 1954. 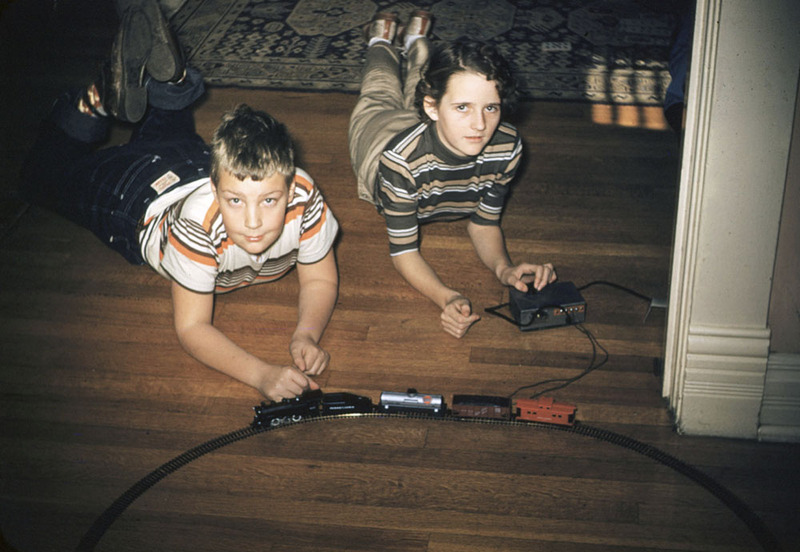 These setups are not exactly what model railroaders consider to be a serious layout, but they were fun when I was seven. Me with my girlfriend at the time, Janice Gay Davis, in 1955. I just set up my new Canon Printer that I got at a bargain price. 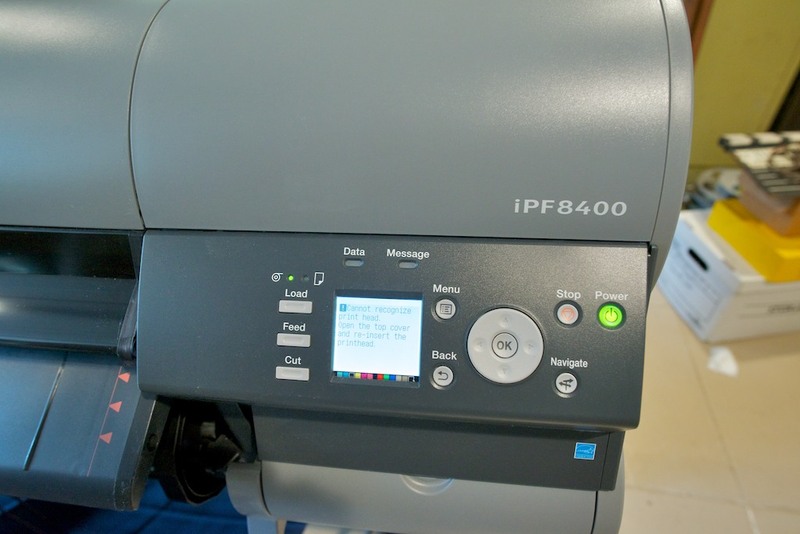 It is the ImagePROGRAF iPF8400 model which is the workhorse in many professional print shops. 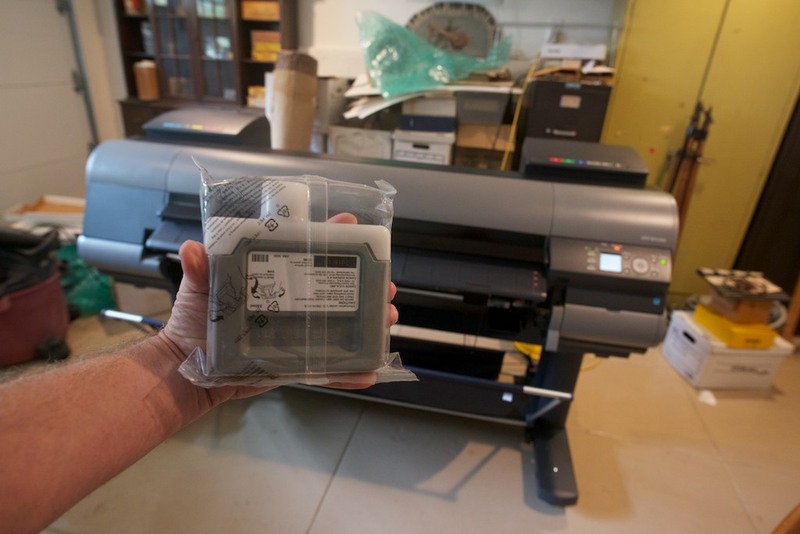 It will print up to 44″ wide media. 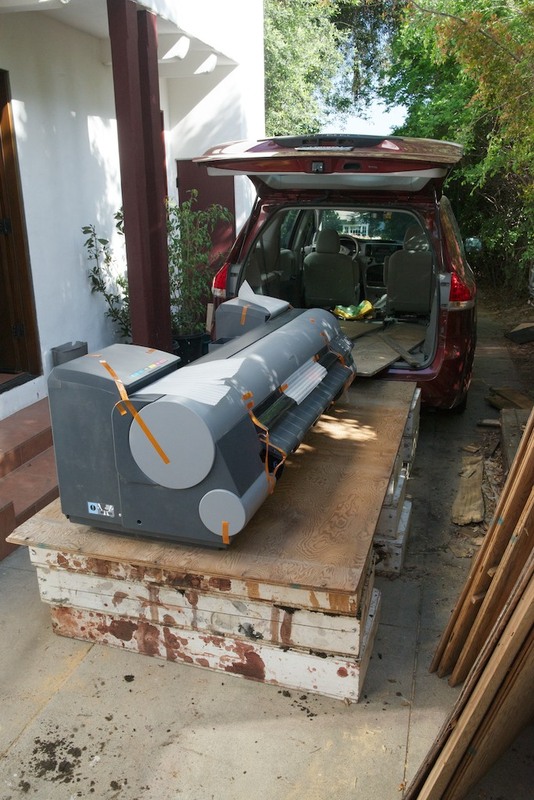 The printer was sitting down at the Canon Distribution center in Costa Mesa. 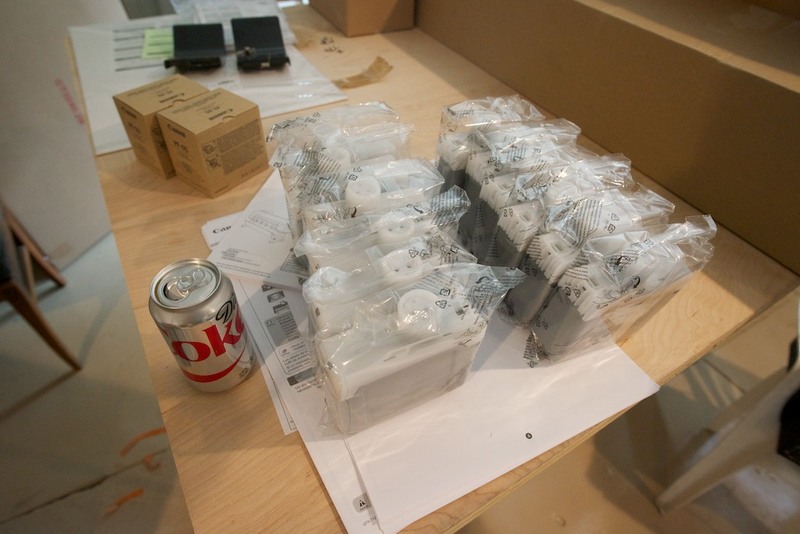 It was open box, the previous model, sort of an orphan printer, and not something Canon could ever sell. It still had the orange packing tape on it. I got it for the price of a set of inks (which it came with) so I basically got the printer for free. Best of all, Canon donated the money to Charity. It is new with a full warranty. I can’t wait to start making prints! 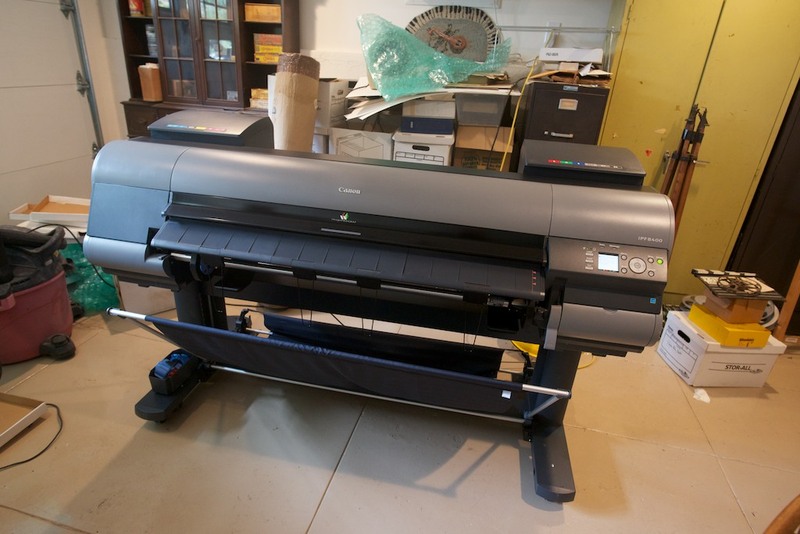 My Epson 7880 still works great, but the deal on the Canon was too good to pass up. Getting it home was an adventure. 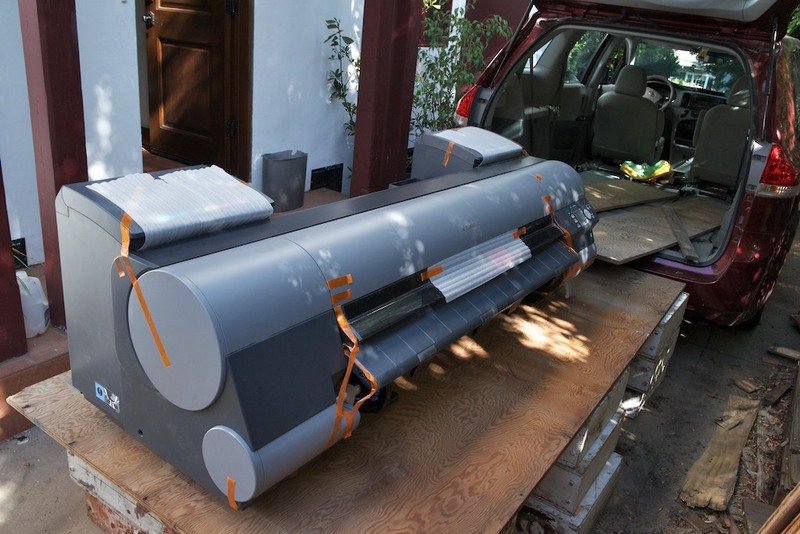 It is just over 6′ long and weights over 200 pounds. I was able to slide it out of the van, but needed four workers to lift it off the platform and onto its base. 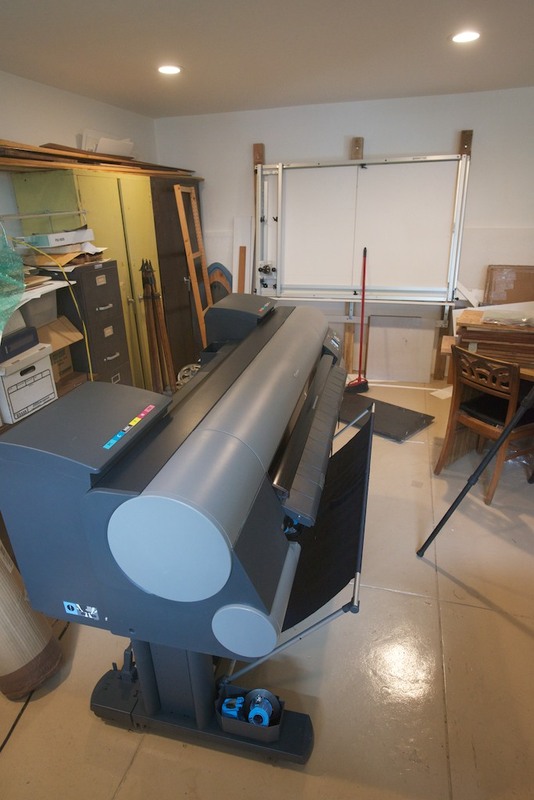 The printer came with a roll around stand which is convenient. 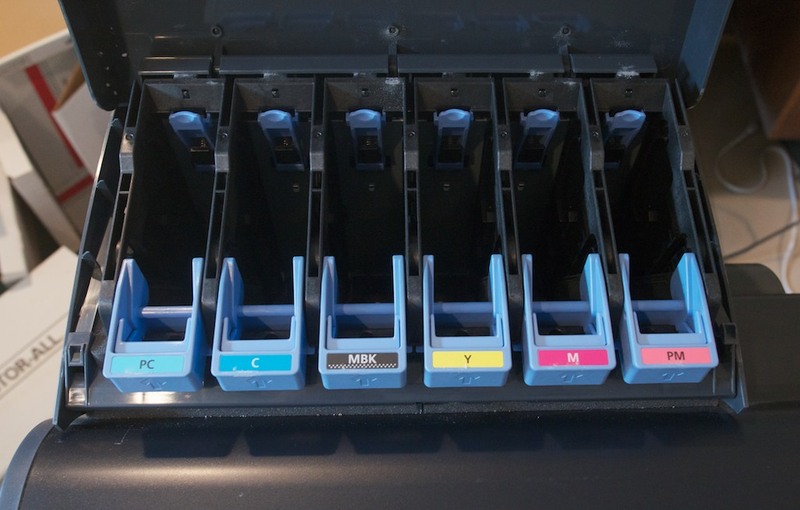 It came with a full set of twelve 330ml ink cartridges. It can also take 750ml cartridges. 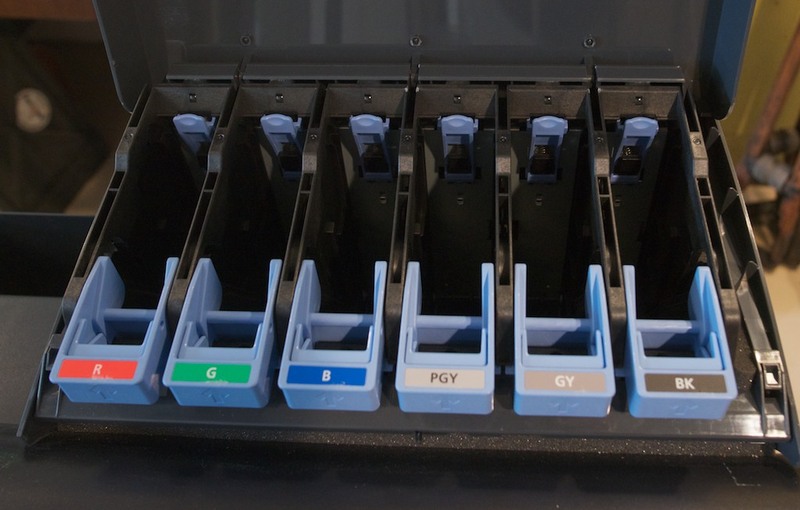 Twelve different inks, including Red, Green, and Blue for vivid colors. It is in the studio where I do framing. The room used to feel large, but it has shrunk with the printer added in.